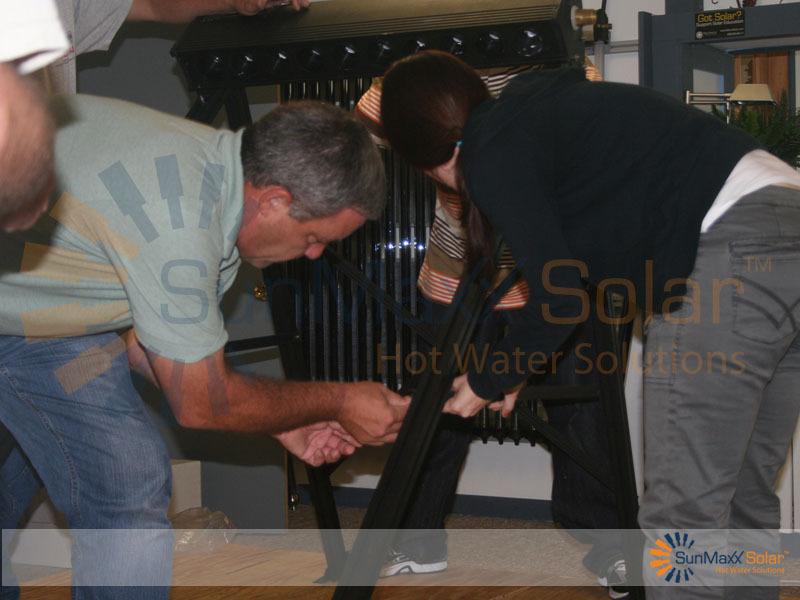 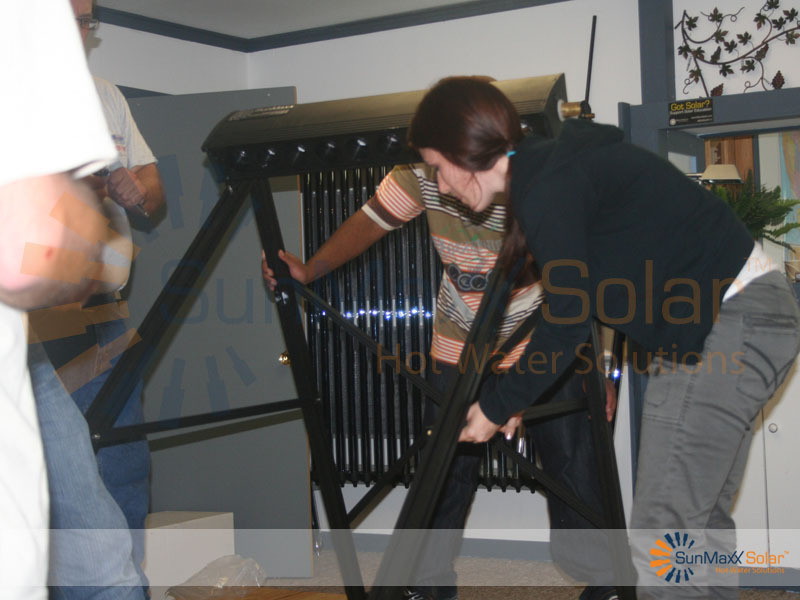 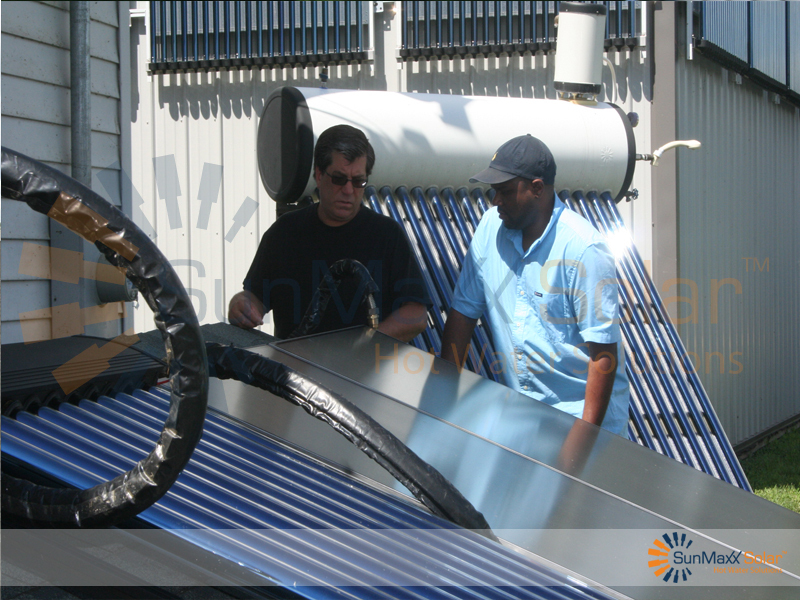 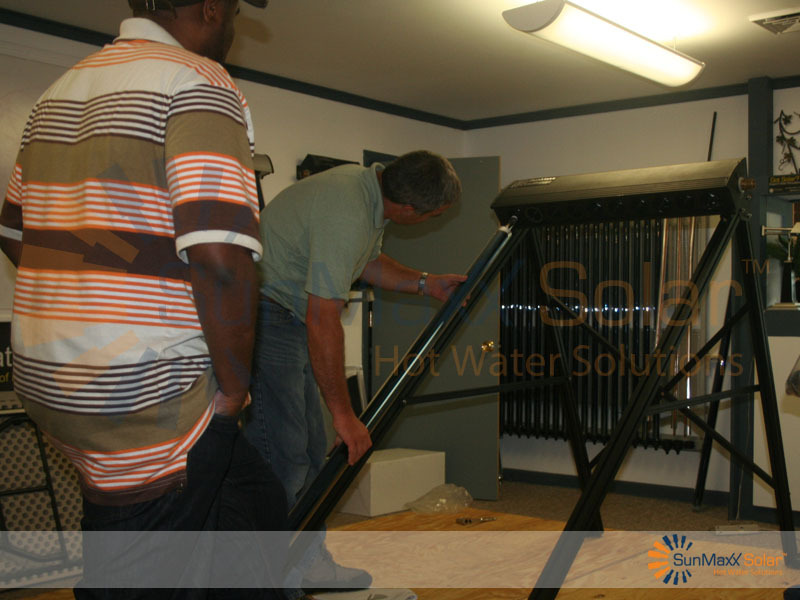 Take Your Business To The Next Level As A Solar Thermal Installer! 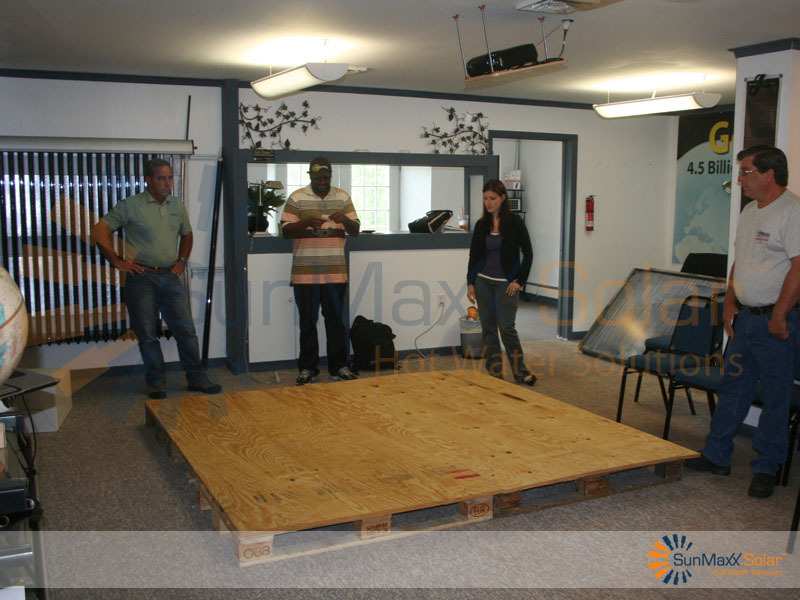 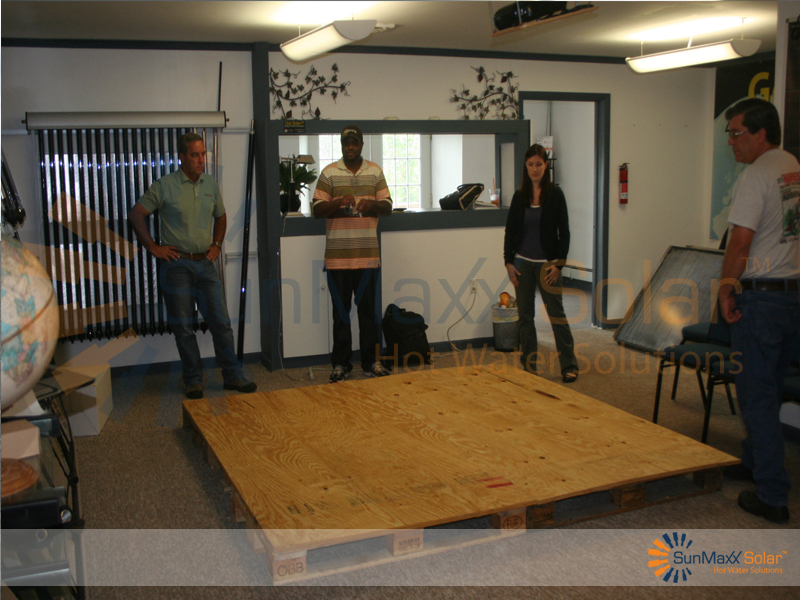 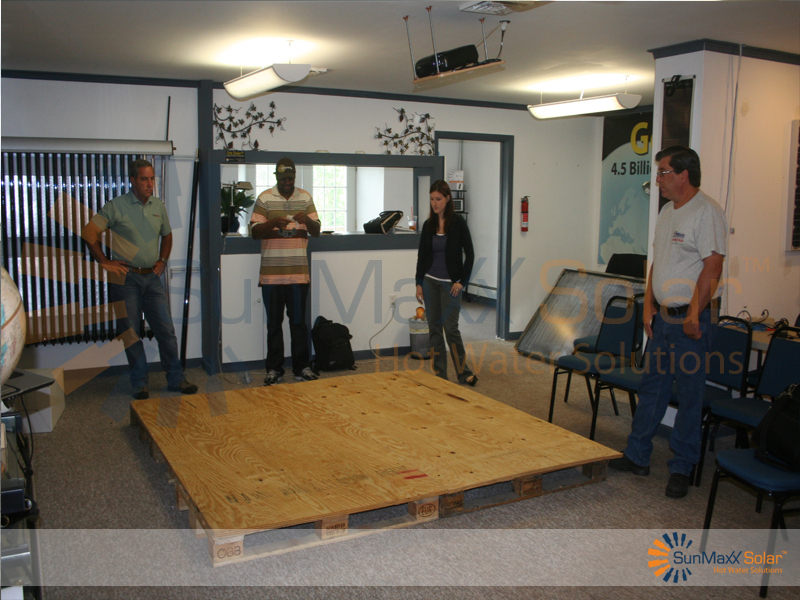 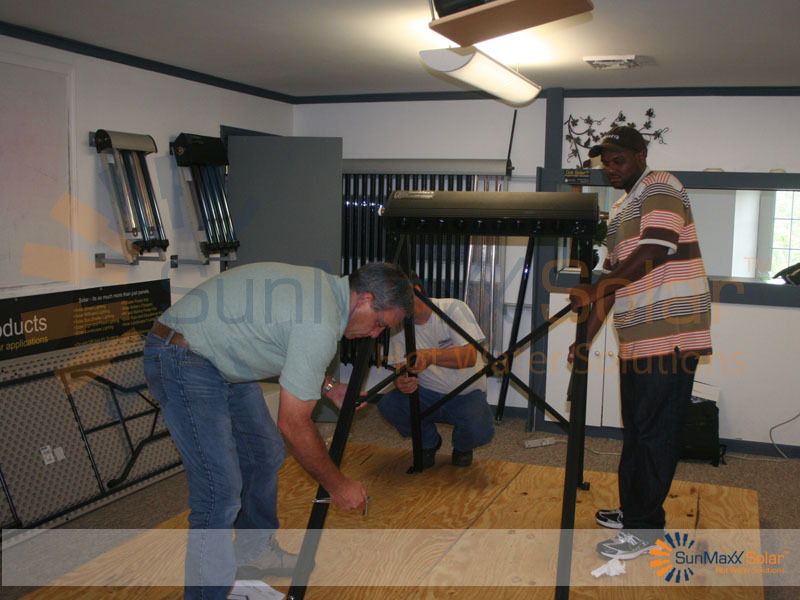 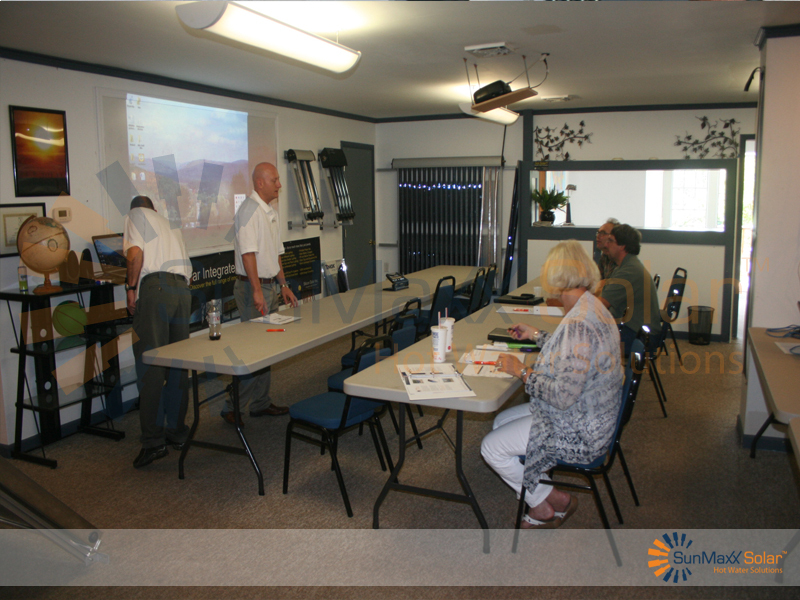 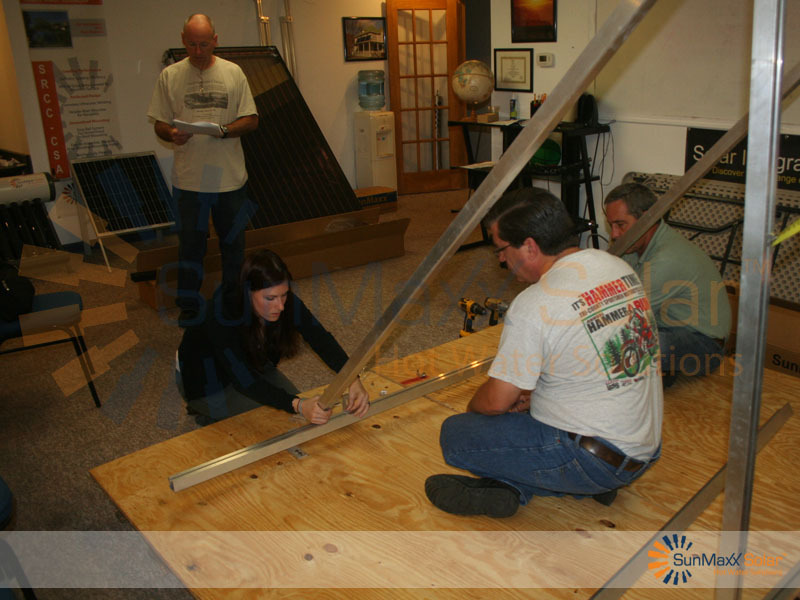 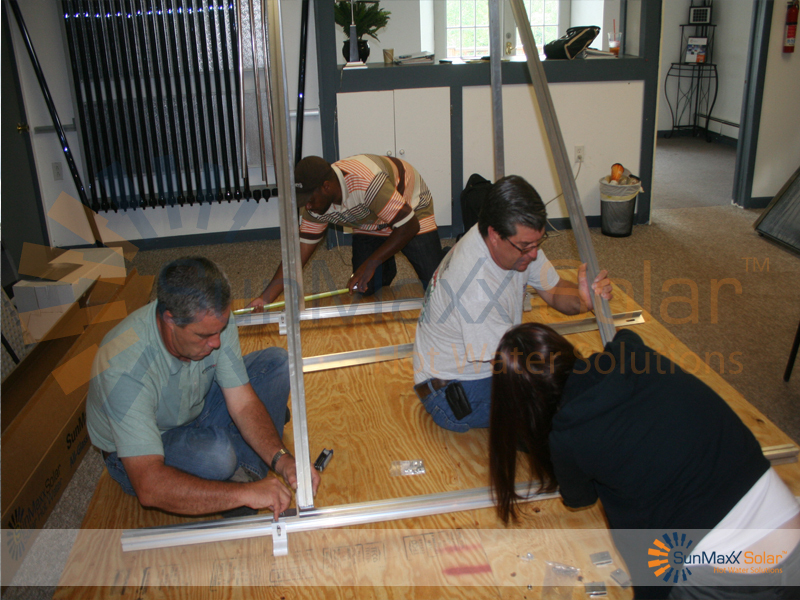 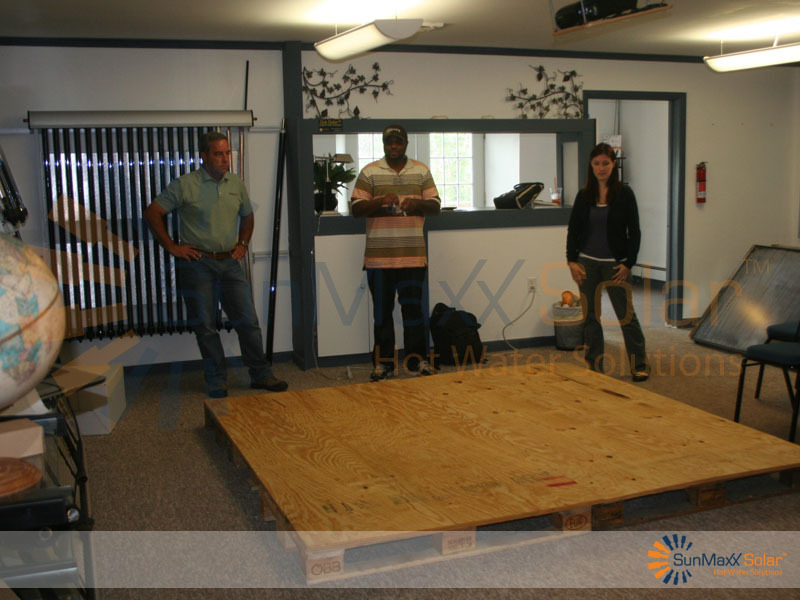 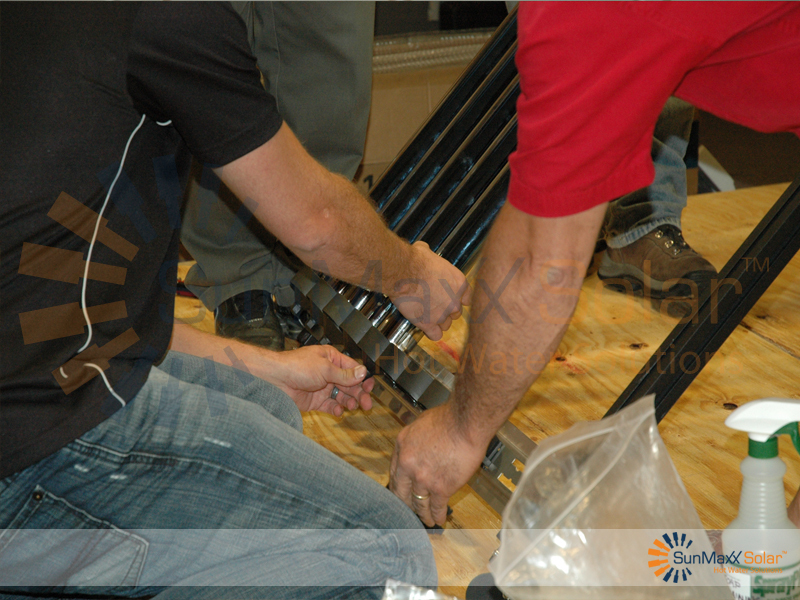 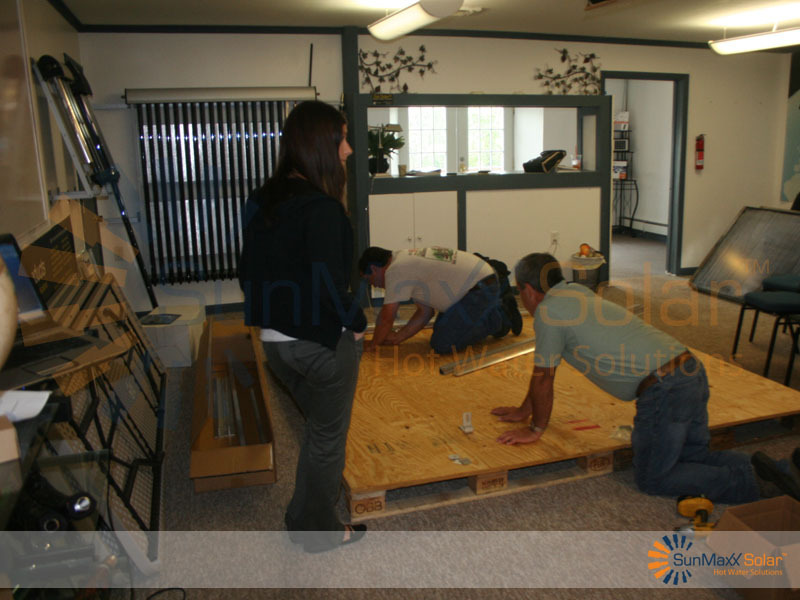 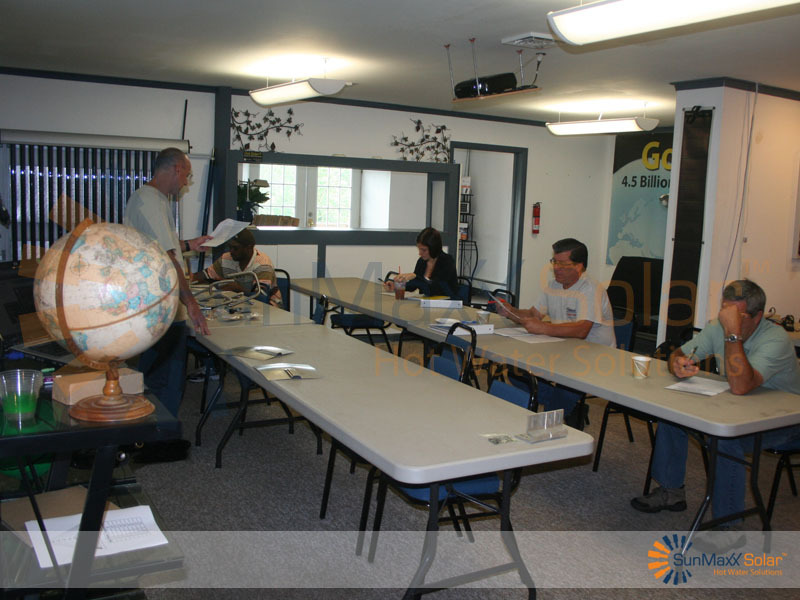 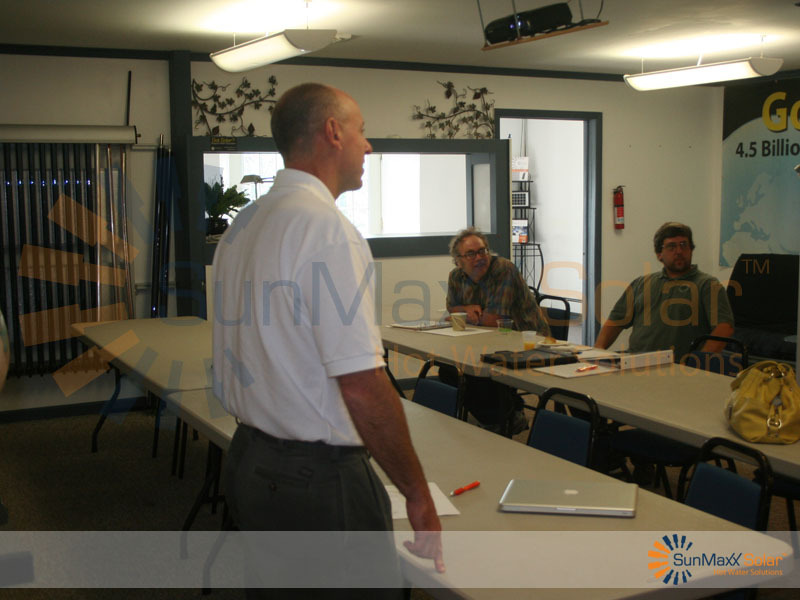 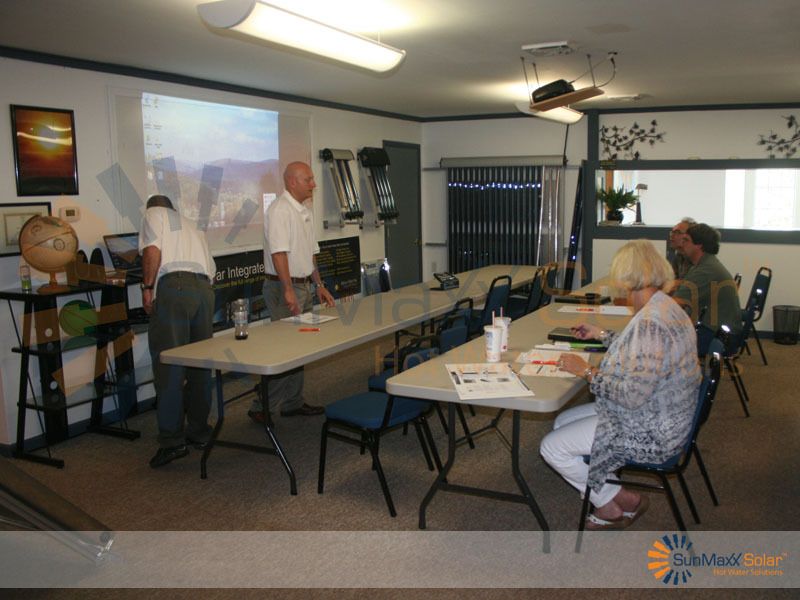 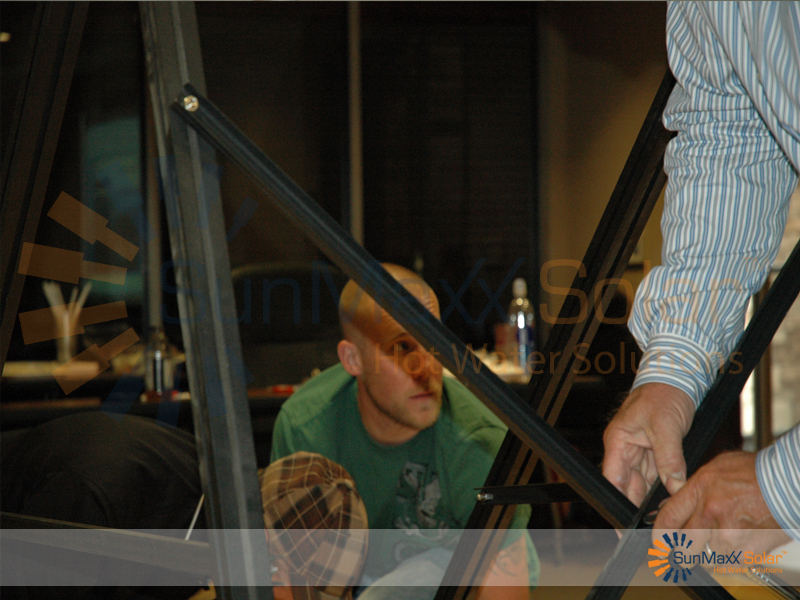 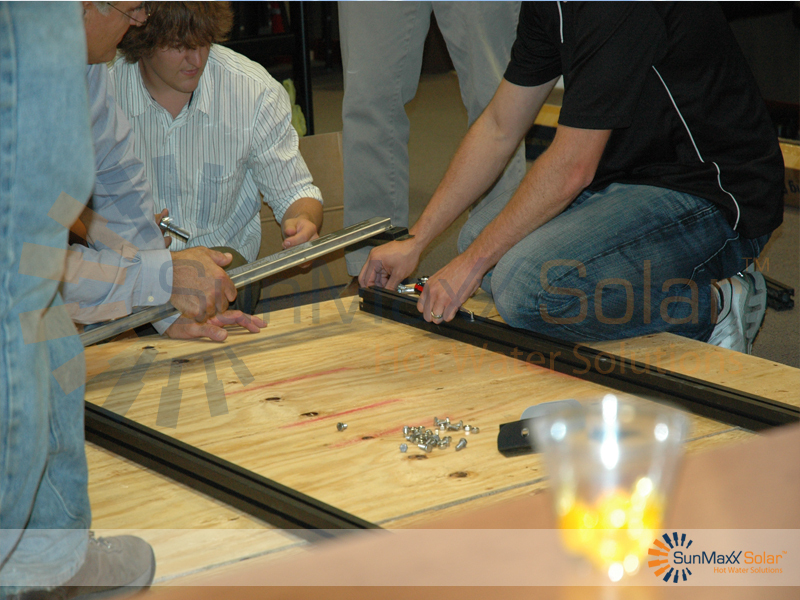 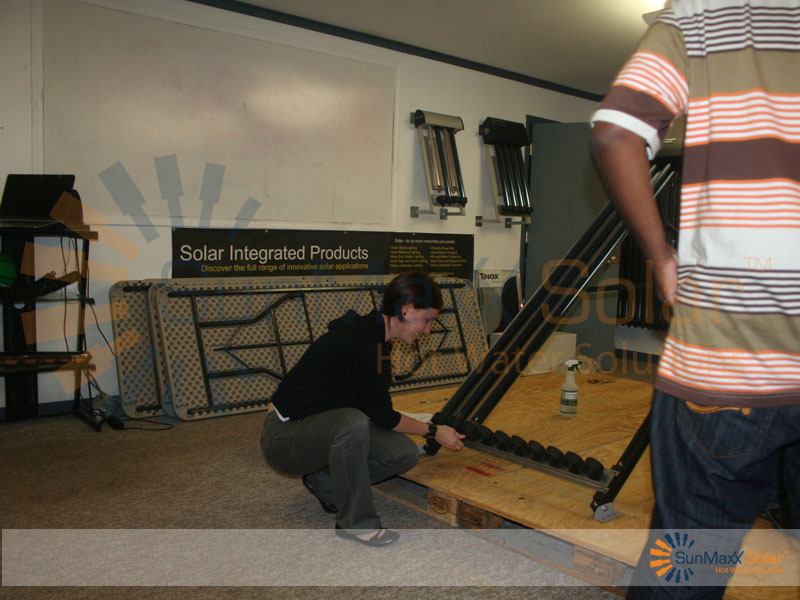 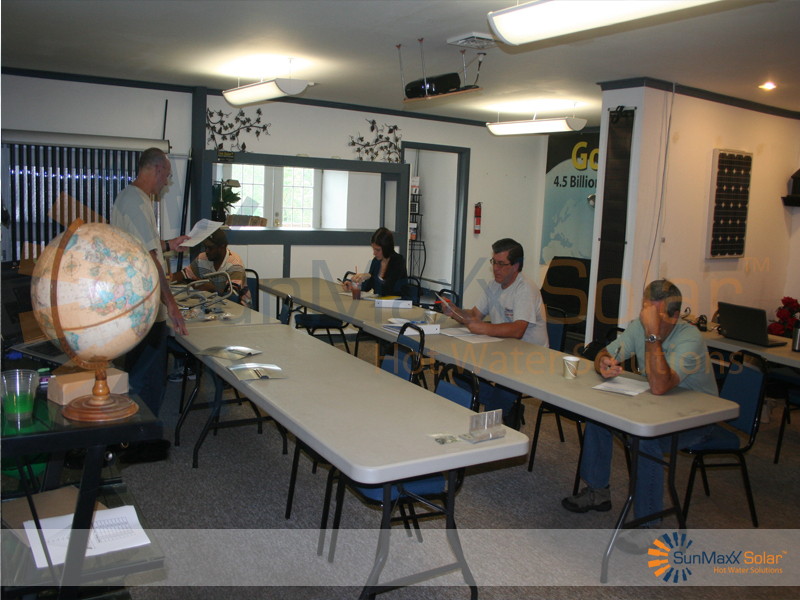 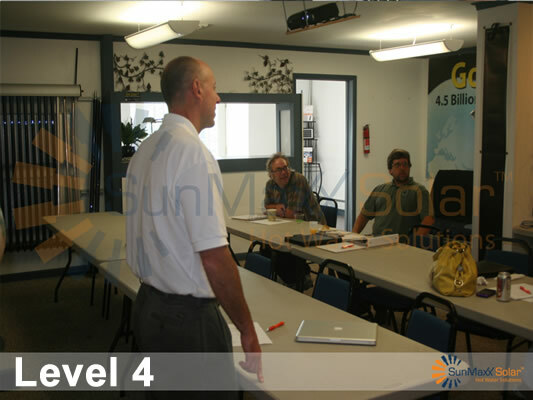 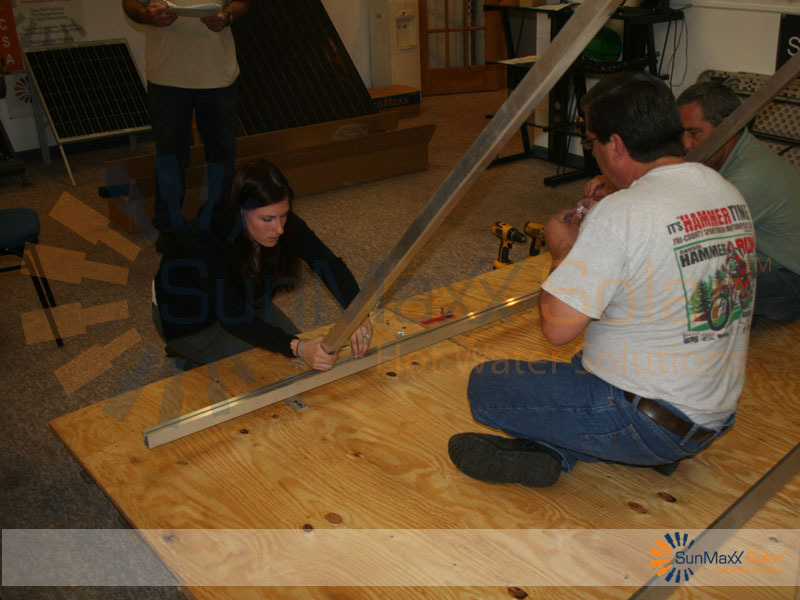 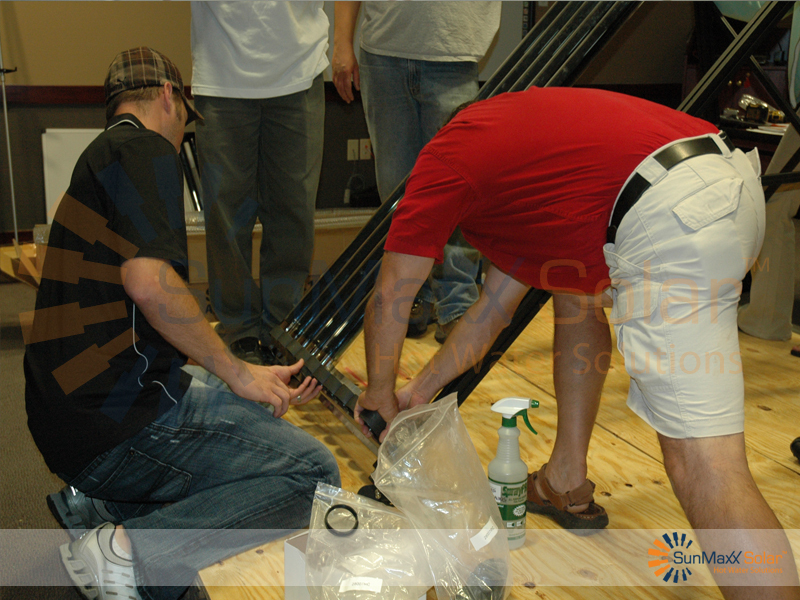 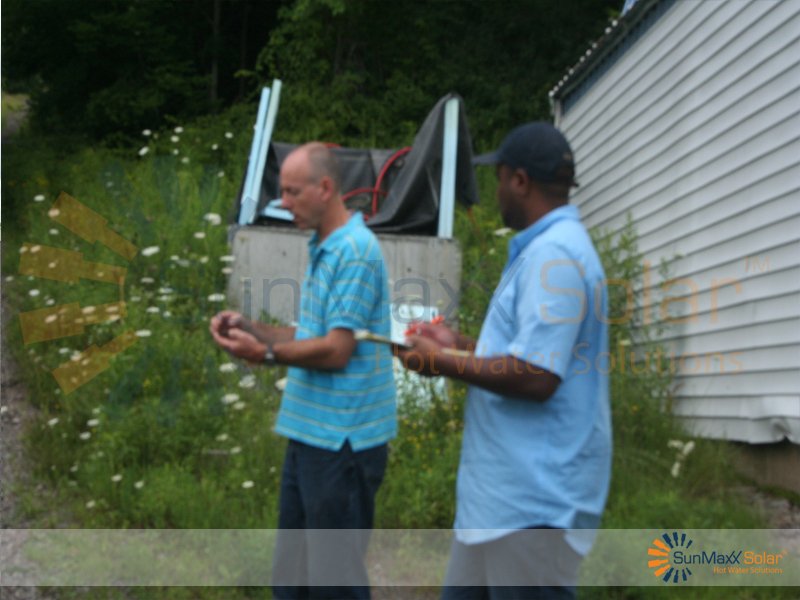 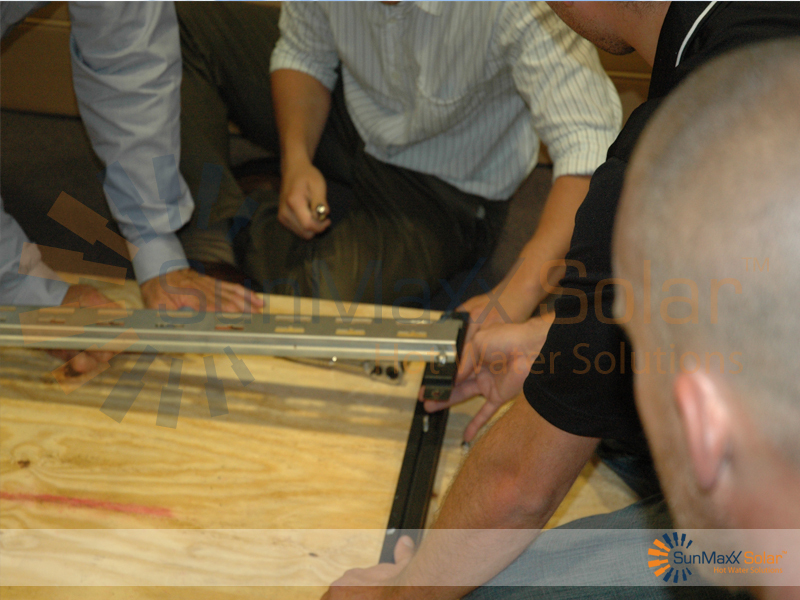 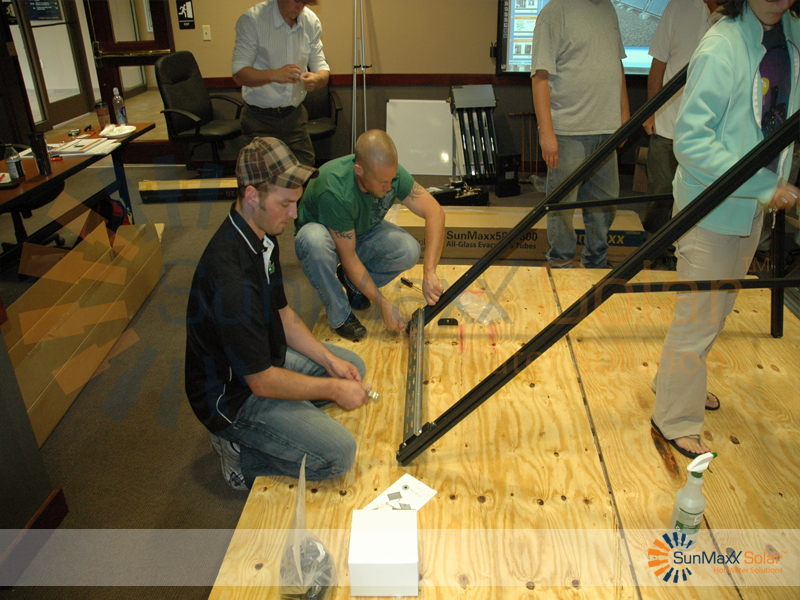 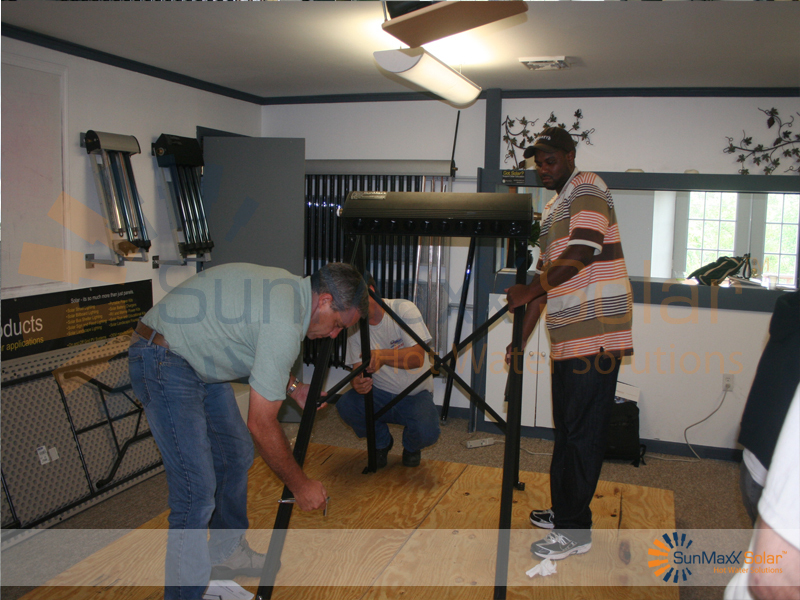 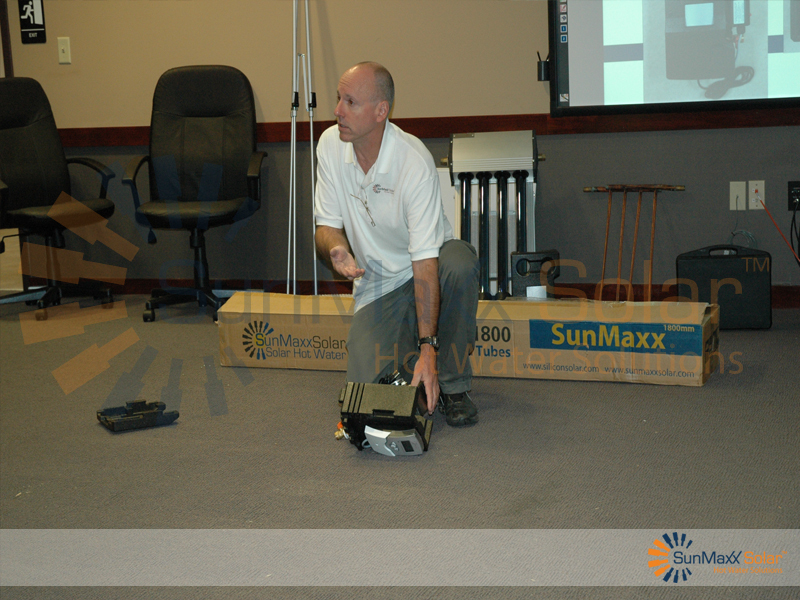 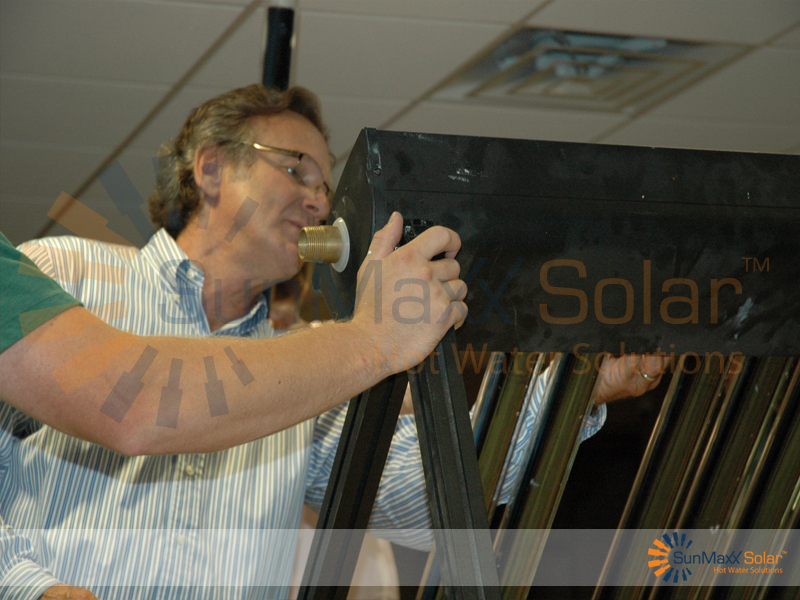 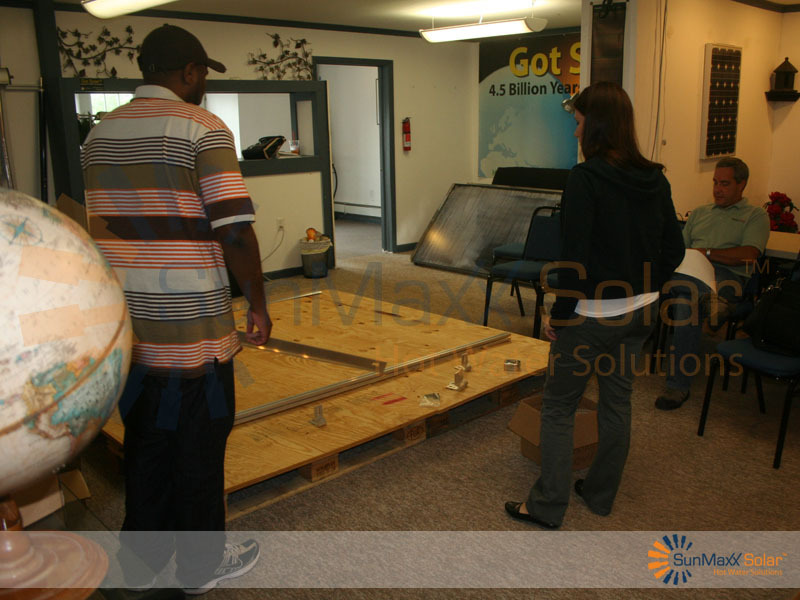 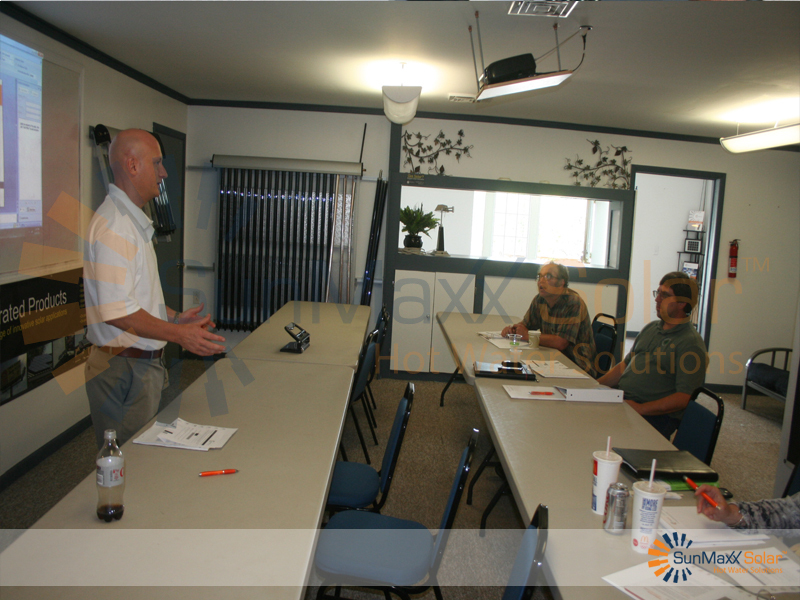 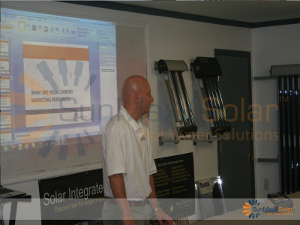 SunMaxx delivers the industry’s most complete, popular & exciting solar installation training workshops! 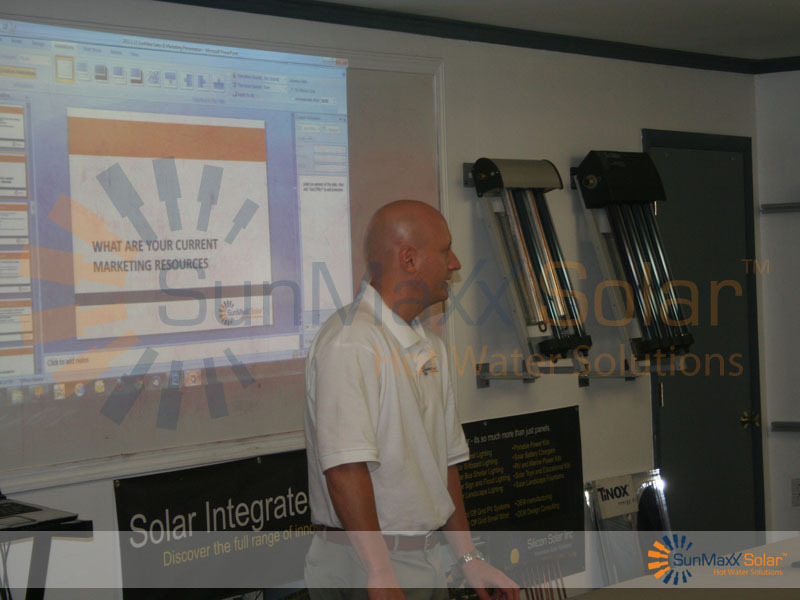 The skills & confidence you need to succeed, whether you’re a beginner or experienced installer (4000 ecstatic students world-wide can’t be wrong)! 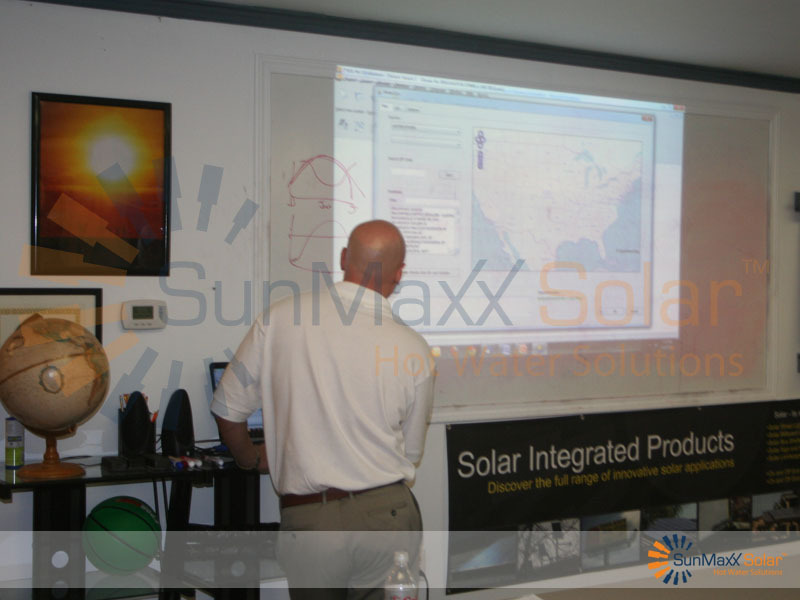 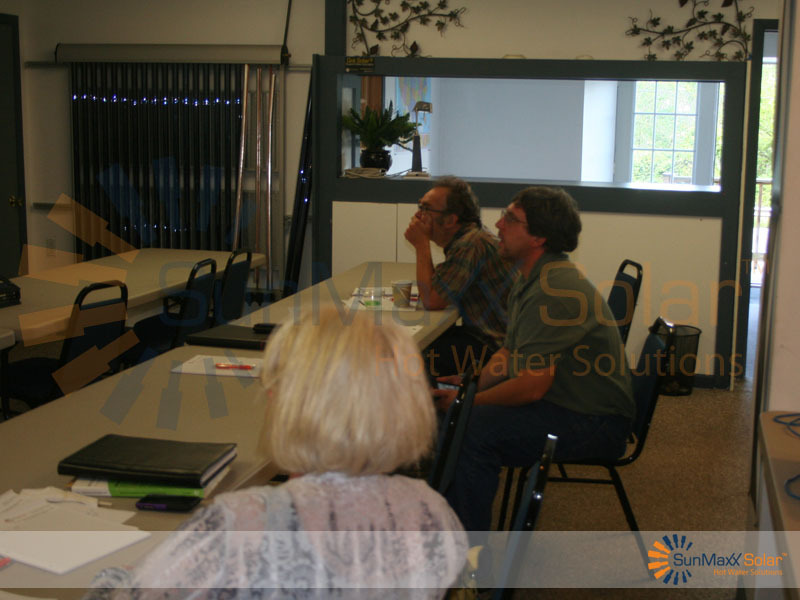 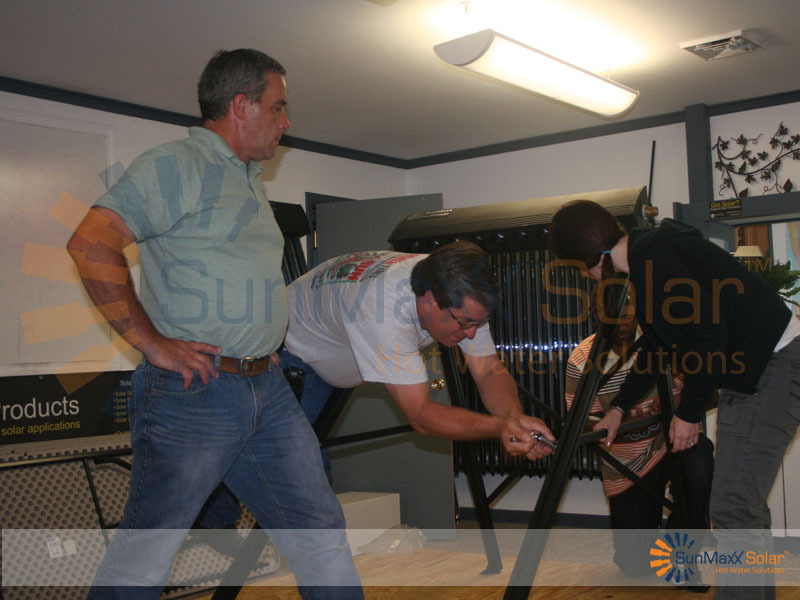 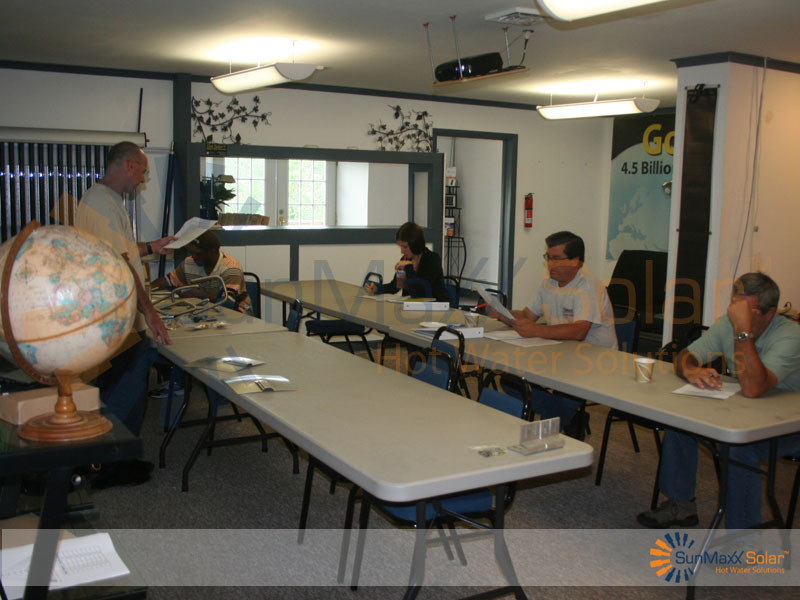 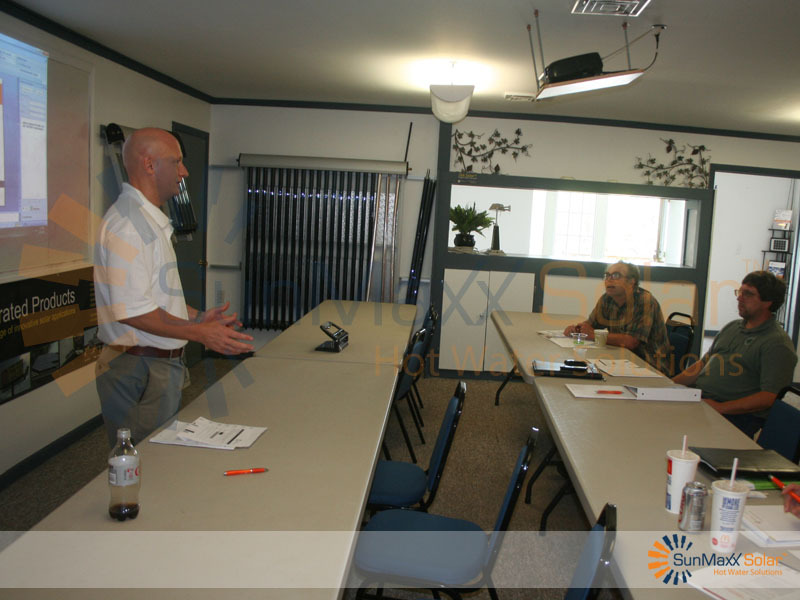 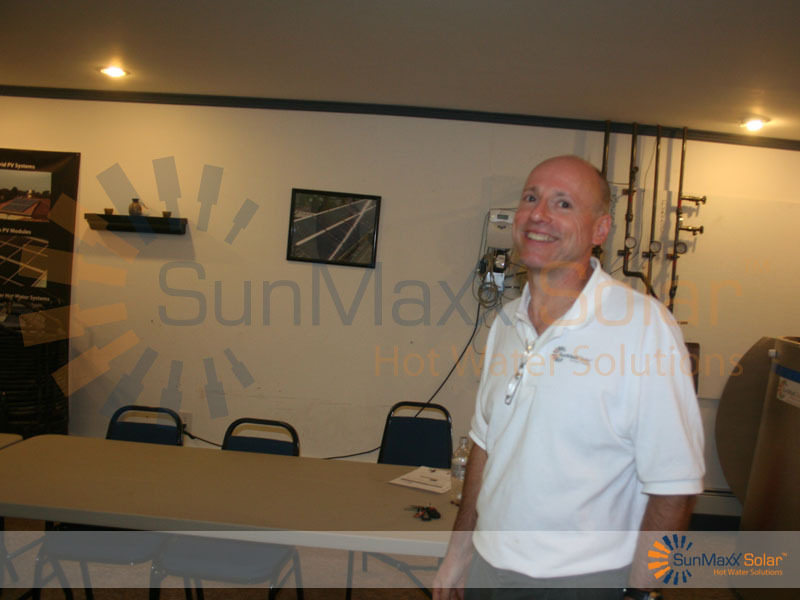 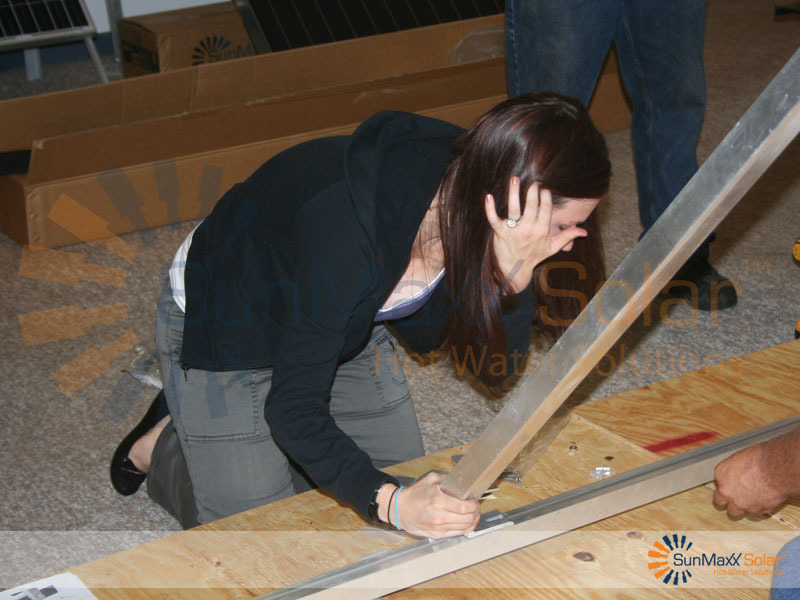 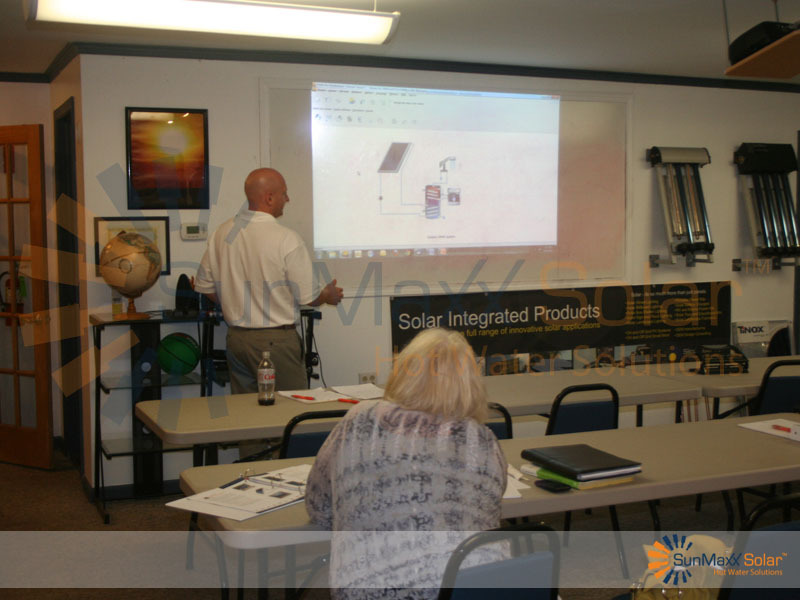 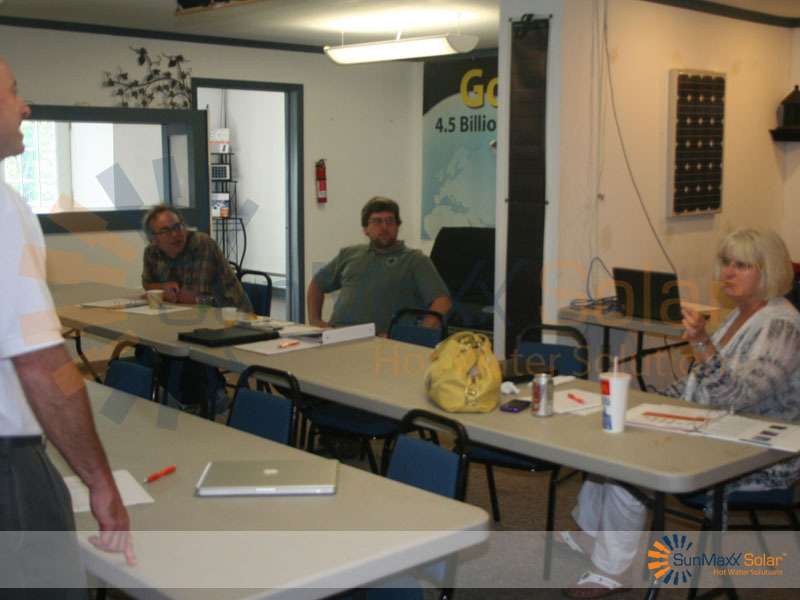 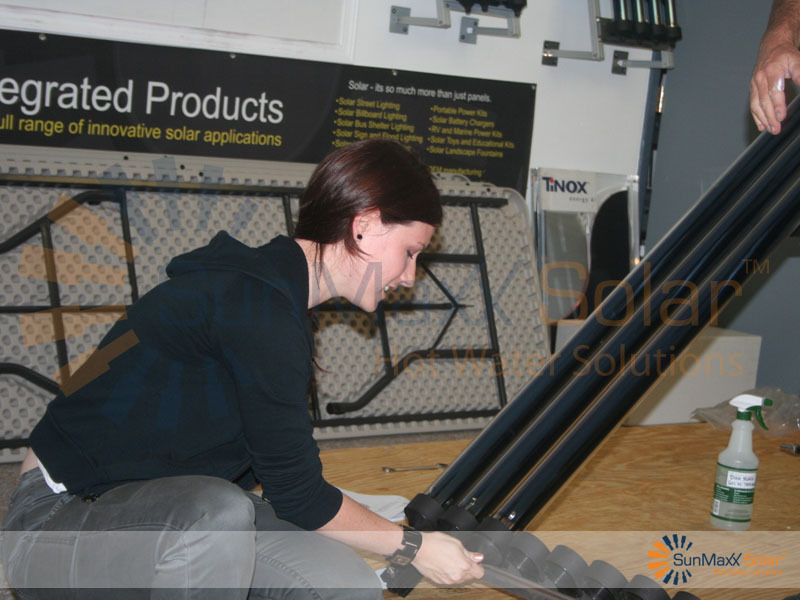 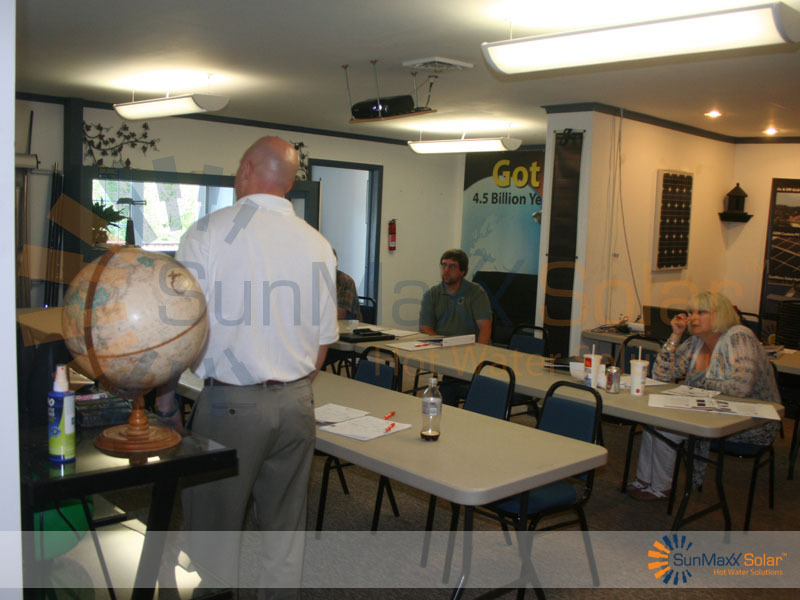 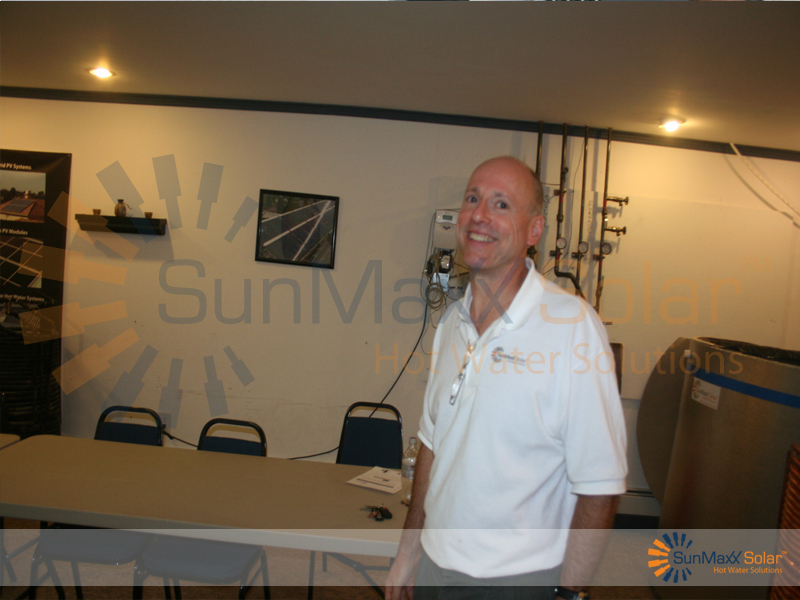 Why Does SunMaxx Offer Solar Training Workshops? 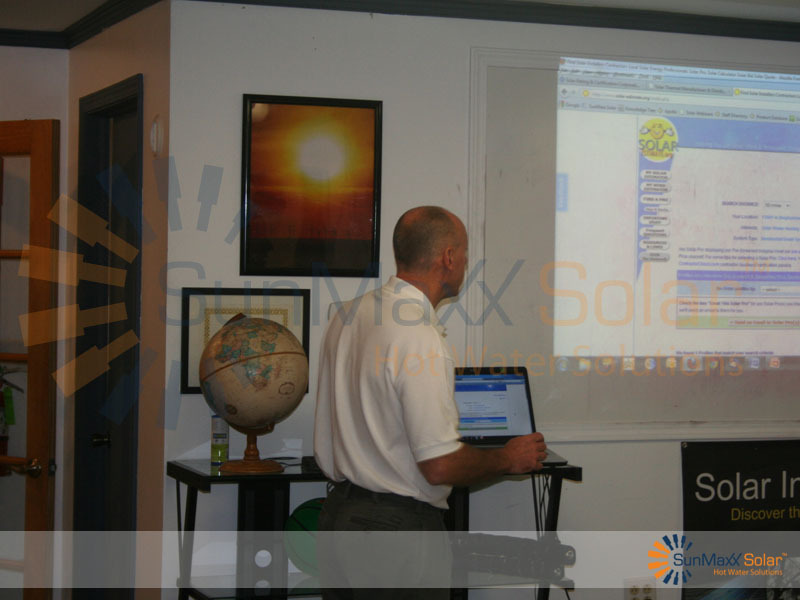 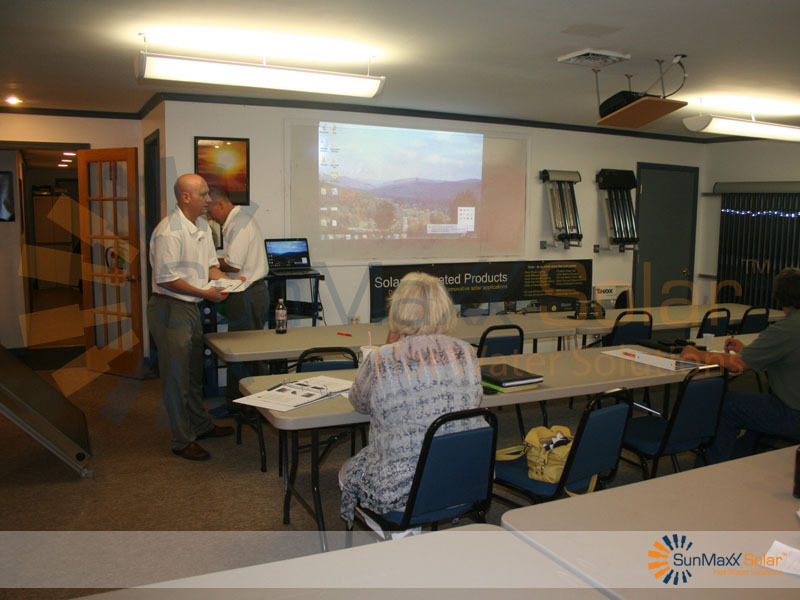 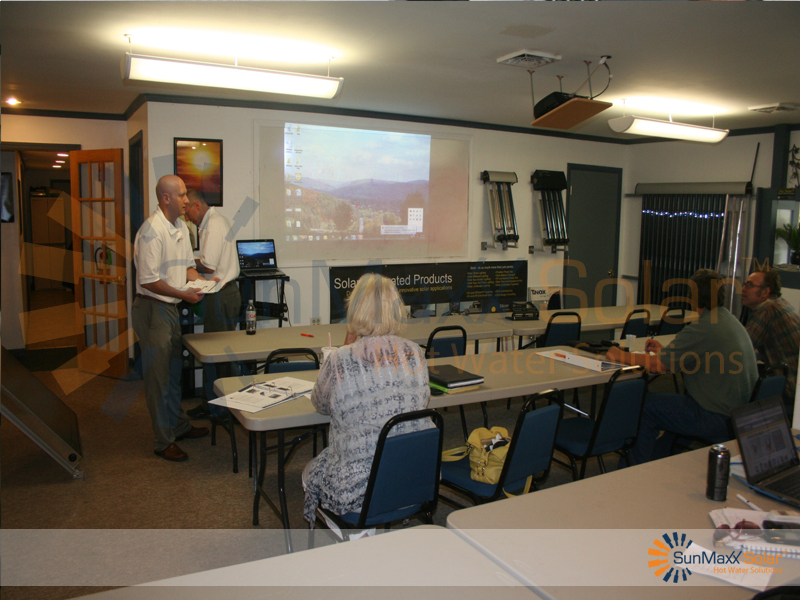 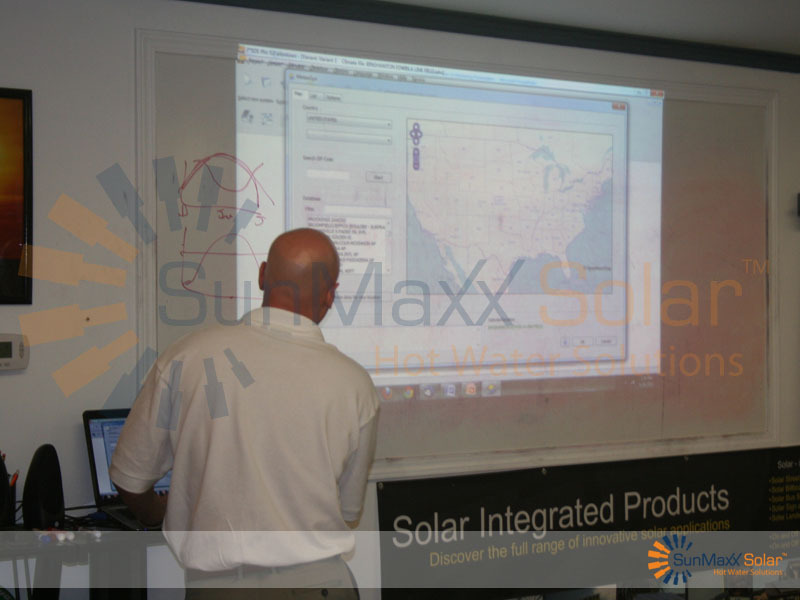 Our solar installation training program started internally, as a way to guarantee that SunMaxx had the sales representatives, technicians and support staff on hand to deliver maximum value to each of our dealers, installers & end-user customers. 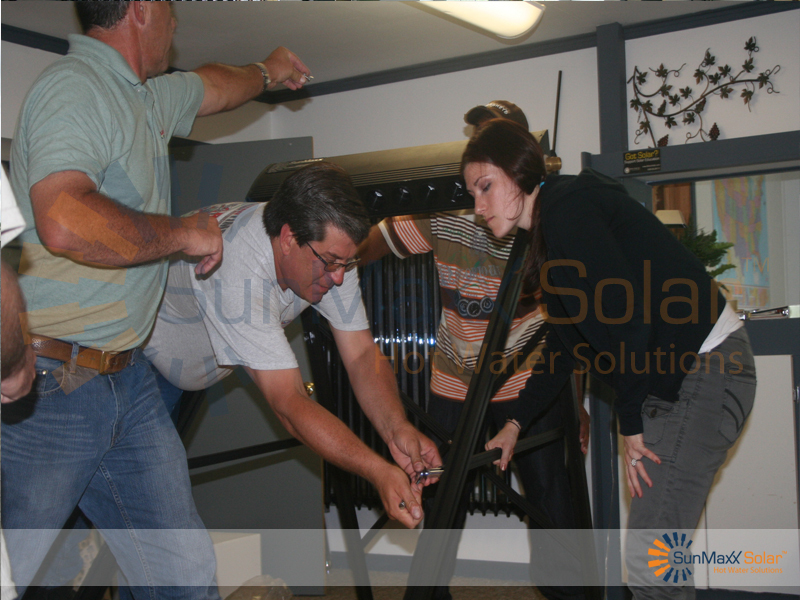 They couldn't find a qualified, certified and professional solar installer in their city or town! We realized that the solar industry is only as strong as the boots on the ground...the men & women designing, installing and maintenancing solar thermal systems...and without professional solar installers from coast to coast, the home and business owners we serve would never be able to take advantage of the financial, health and ecological benefits that SunMaxx solar thermal systems deliver. 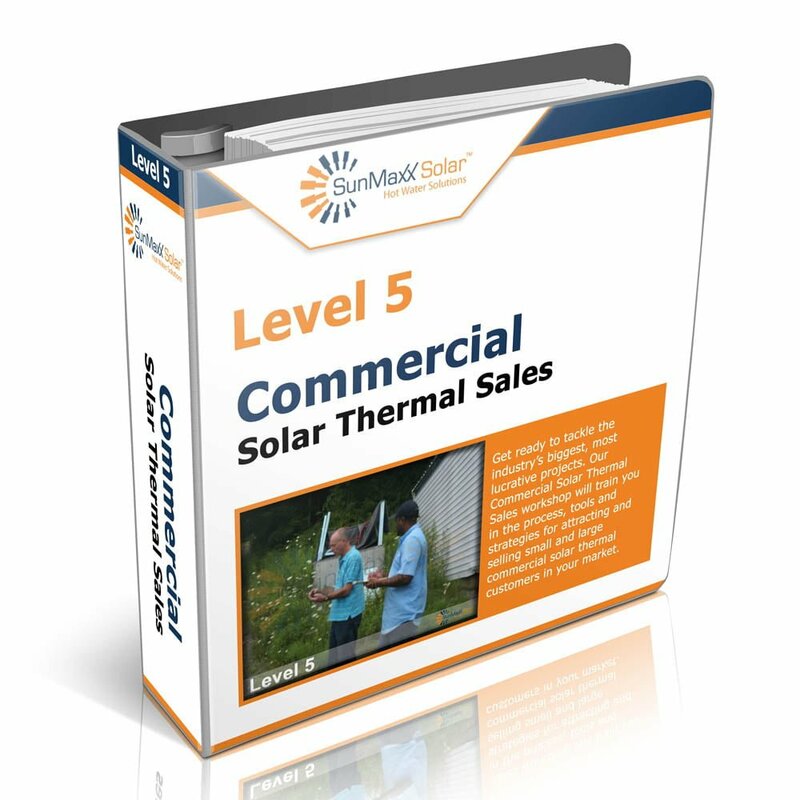 to give today's consumer access to the most professional, best-trained solar thermal installers the market has ever seen (no matter where they live)! 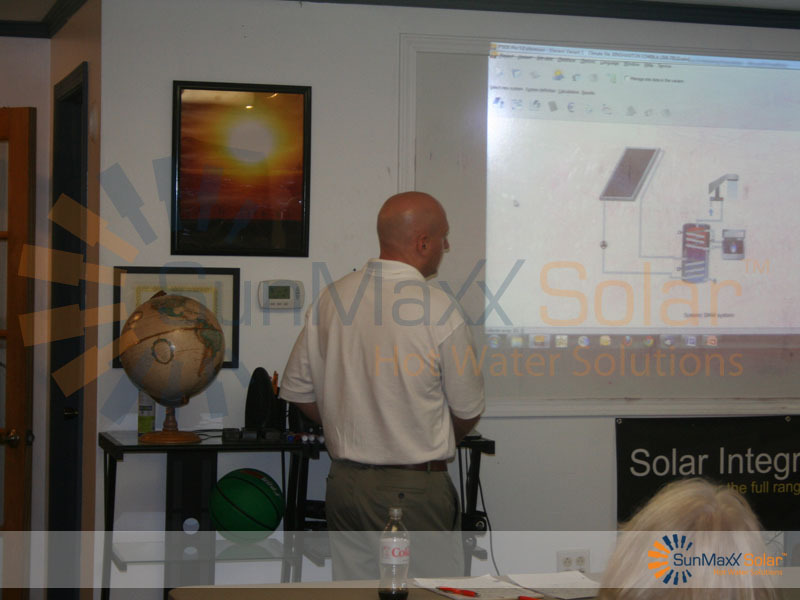 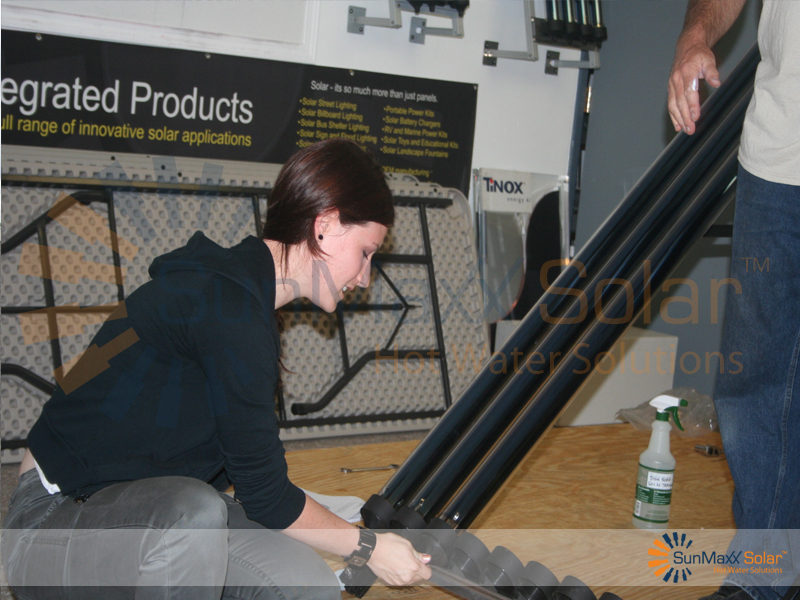 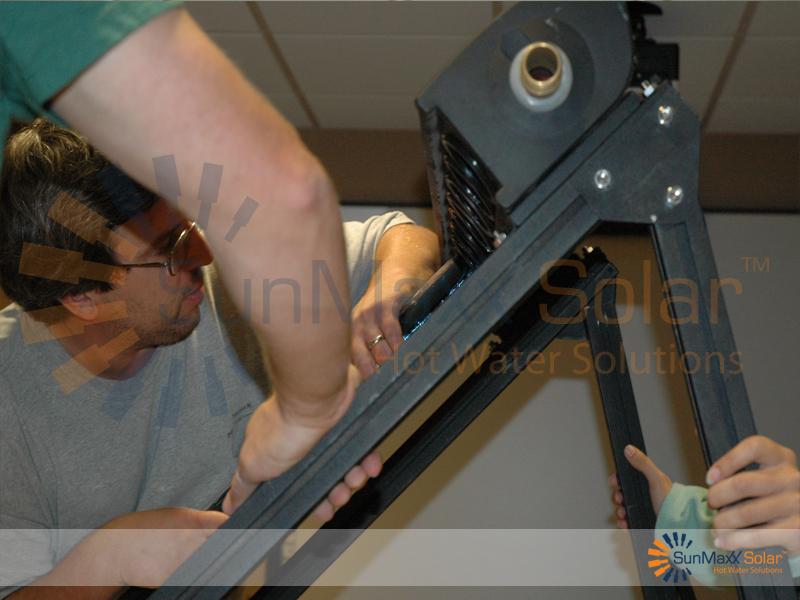 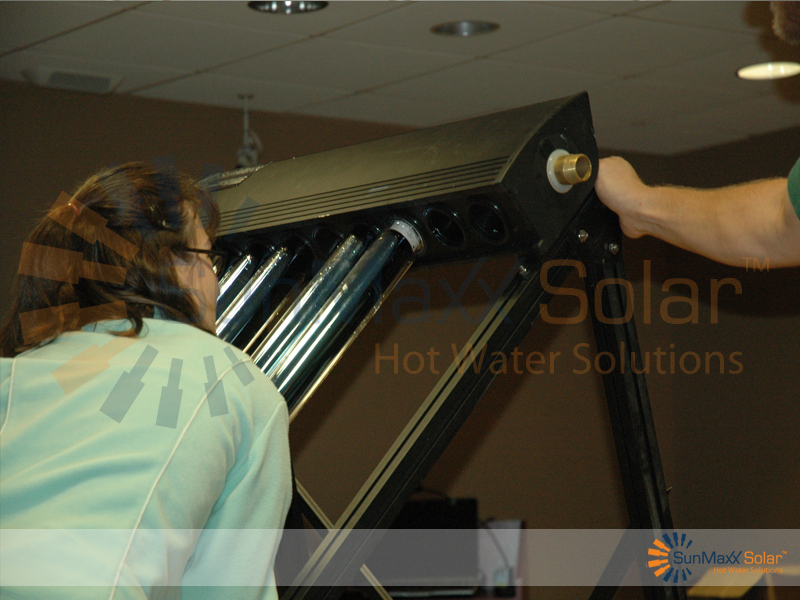 The level 1 solar thermal training course is our basics workshop, and is designed for anyone who is completely new to solar thermal systems and solar thermal installation, as well as experienced solar thermal installers who are looking to make the switch and start installing SunMaxx Solar's hot water systems. 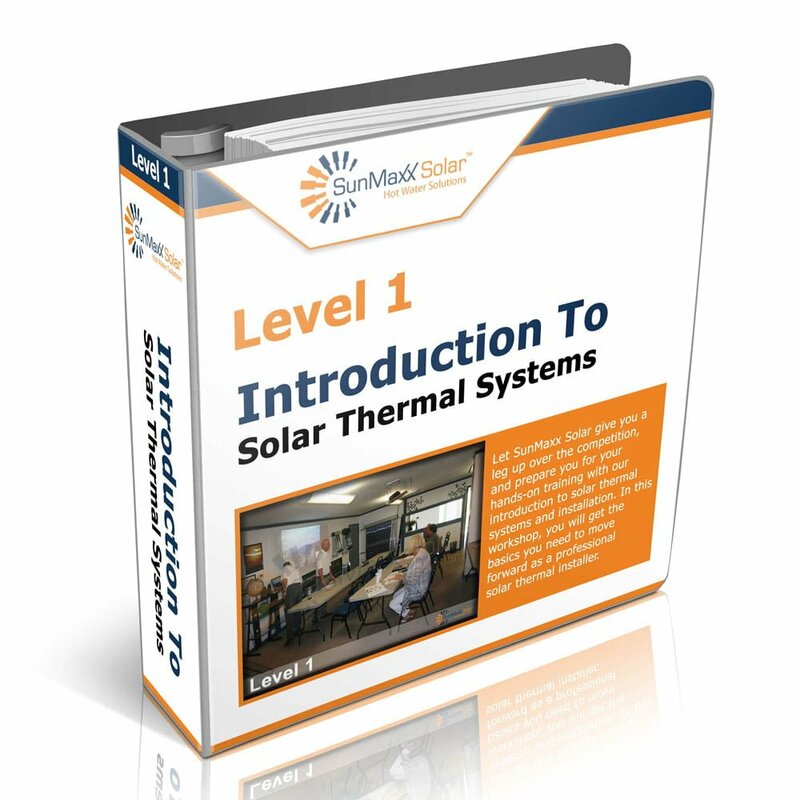 Level 1 is also great for home and business owners who are interested in doing a DIY solar thermal installation at their home or office. 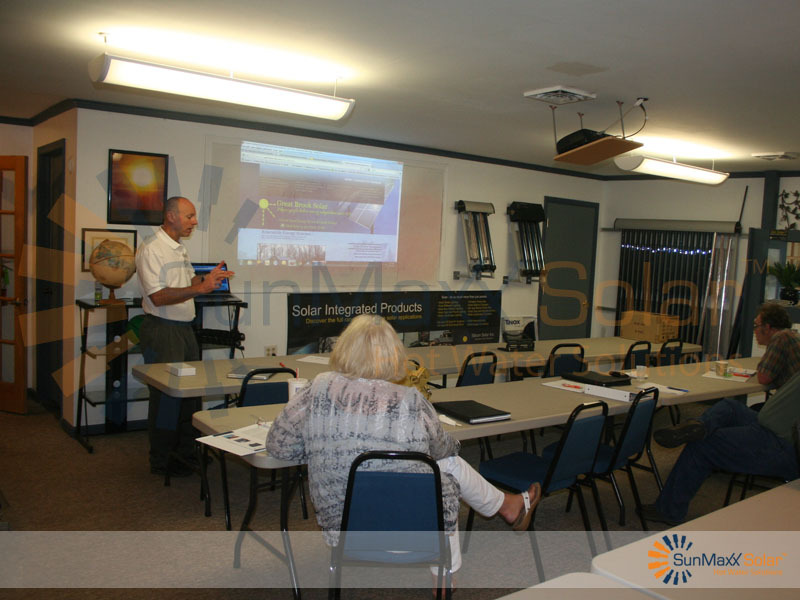 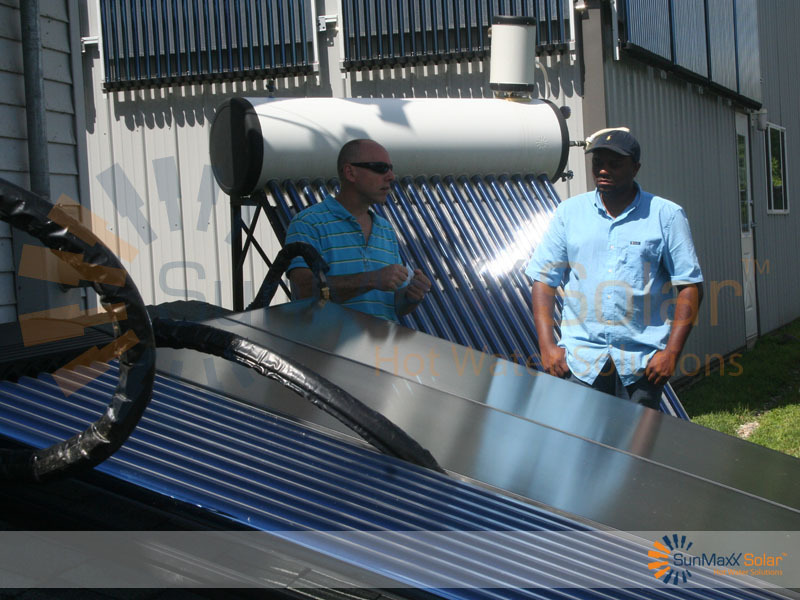 The workshop will give you a solid background in understanding the physical and earth science behind solar thermal systems, the components and function of solar thermal systems, and critical considerations in solar thermal. Levels 2 and 3 are more hands-on than Level 1. 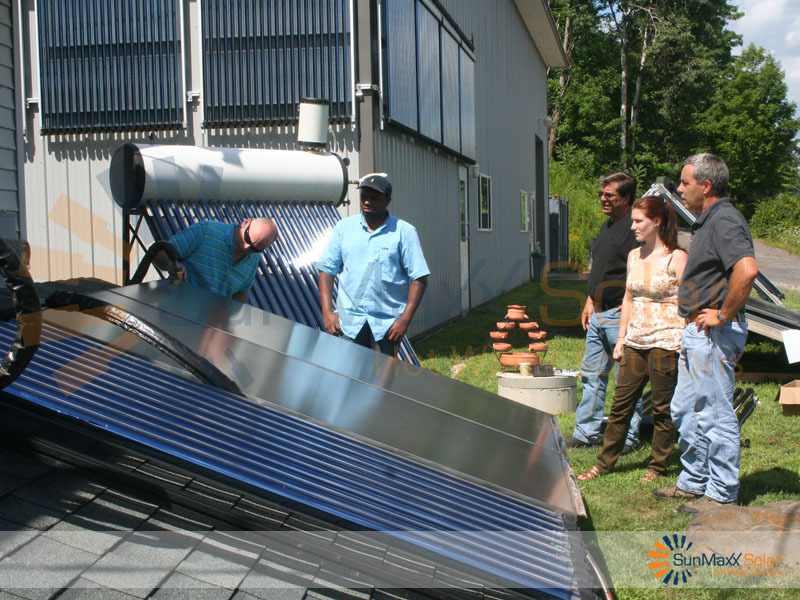 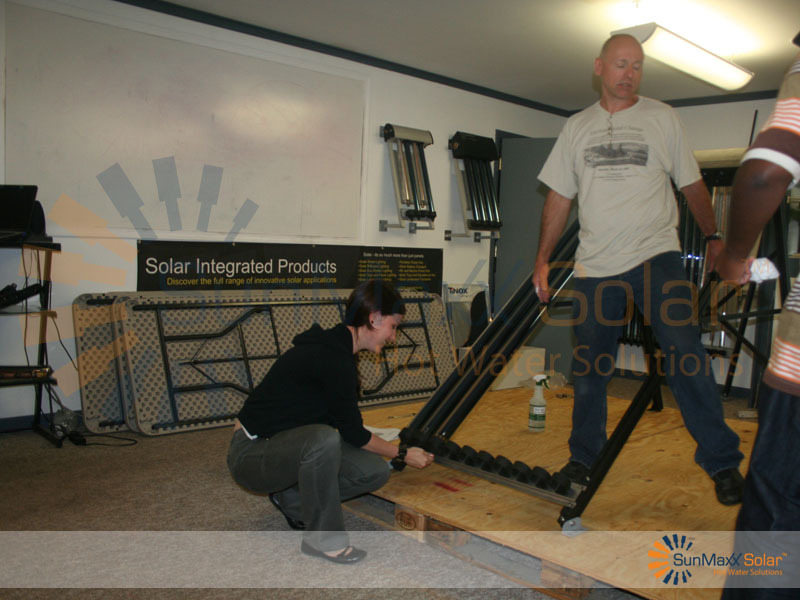 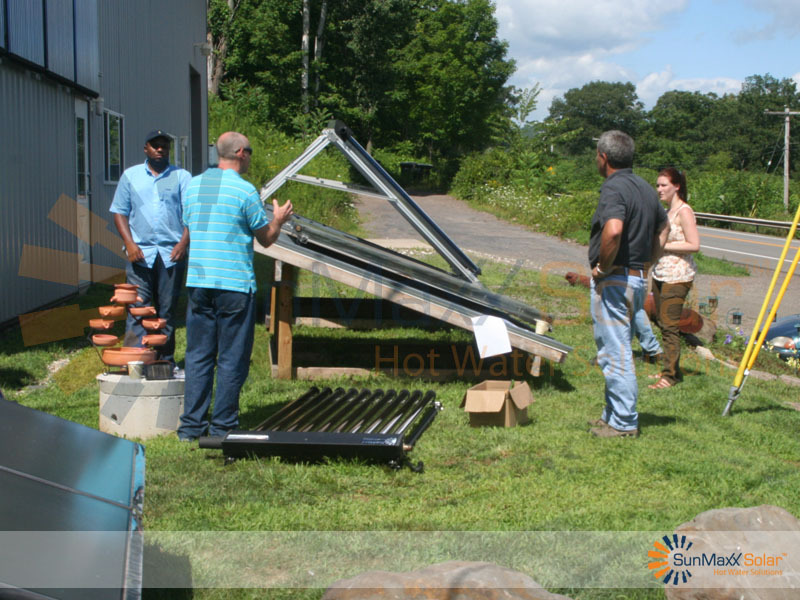 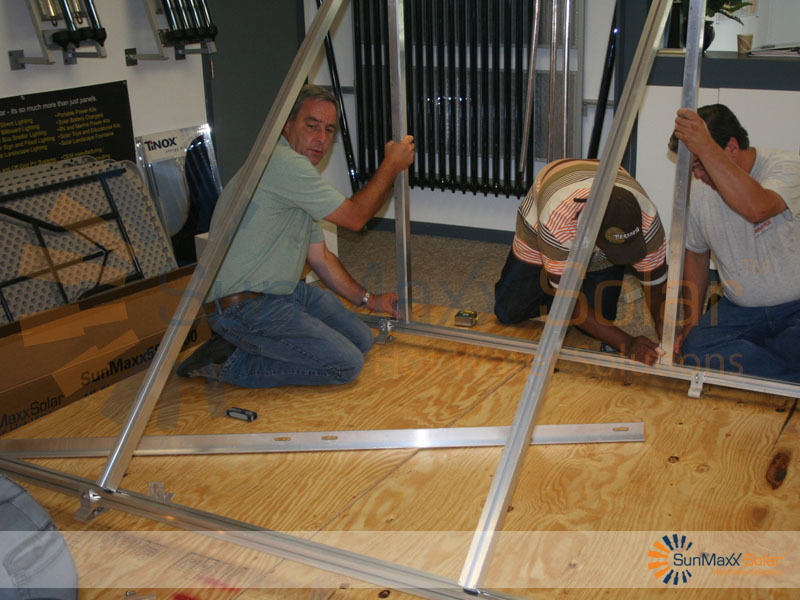 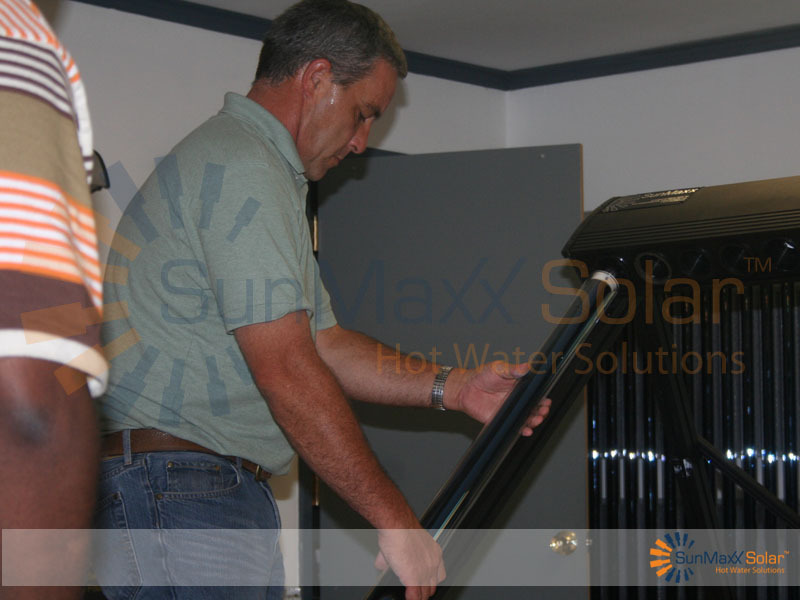 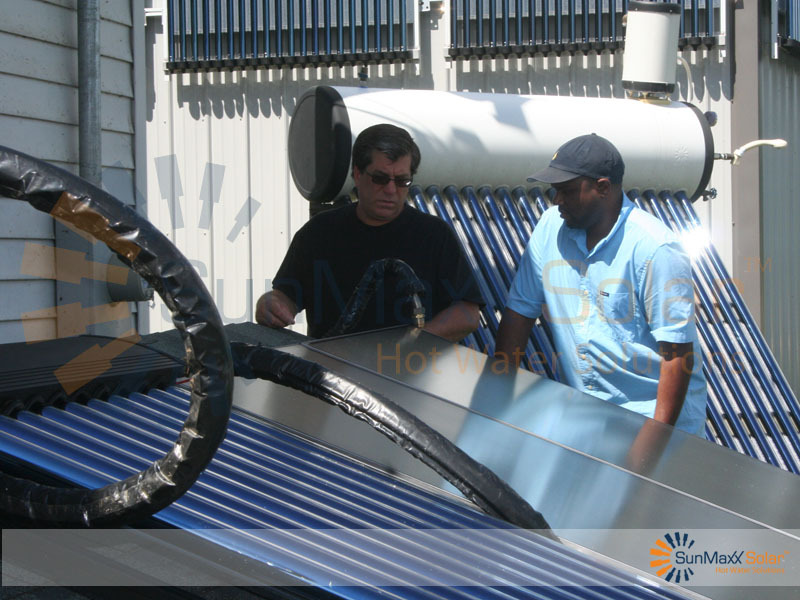 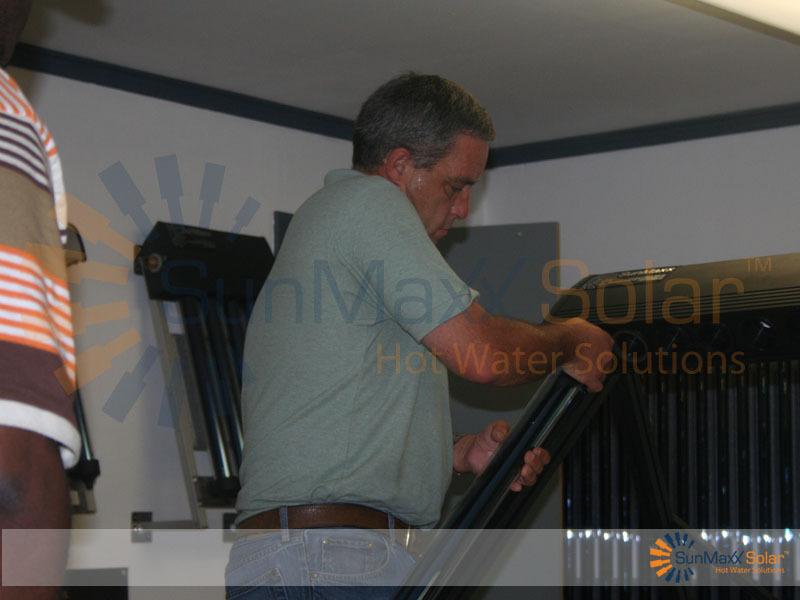 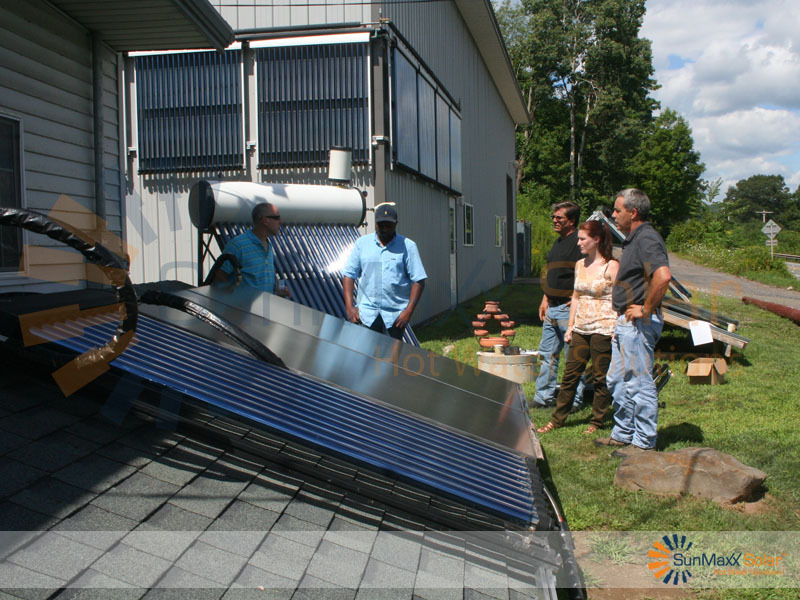 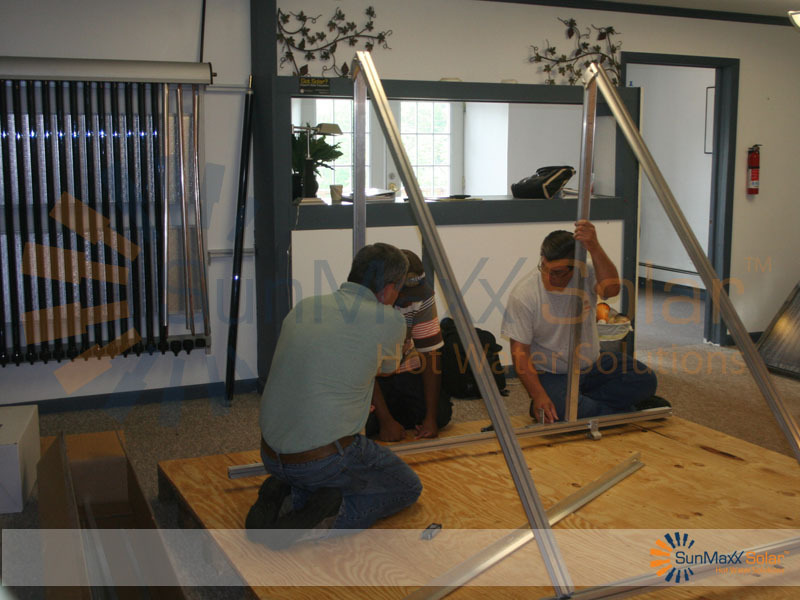 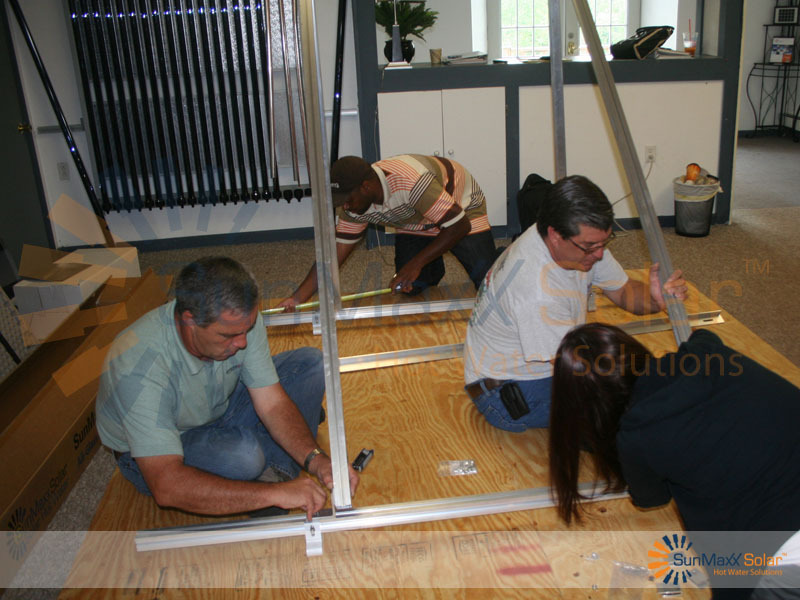 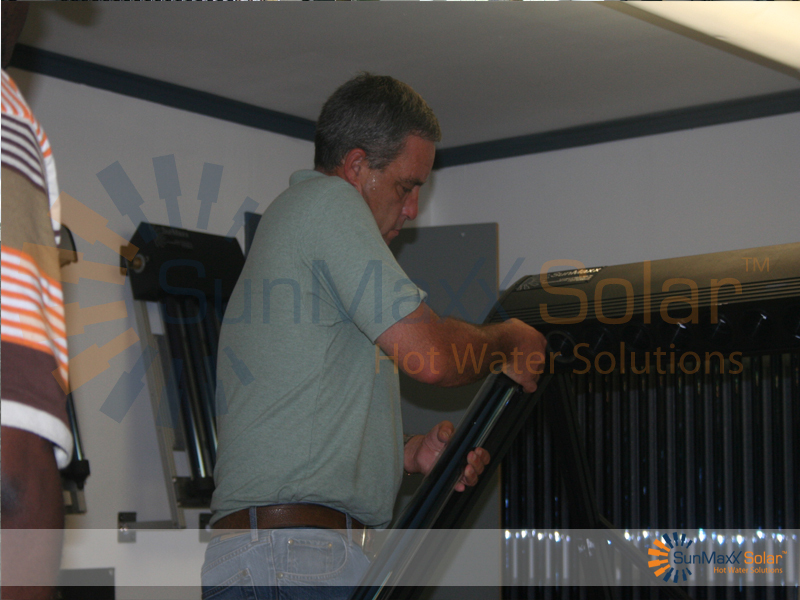 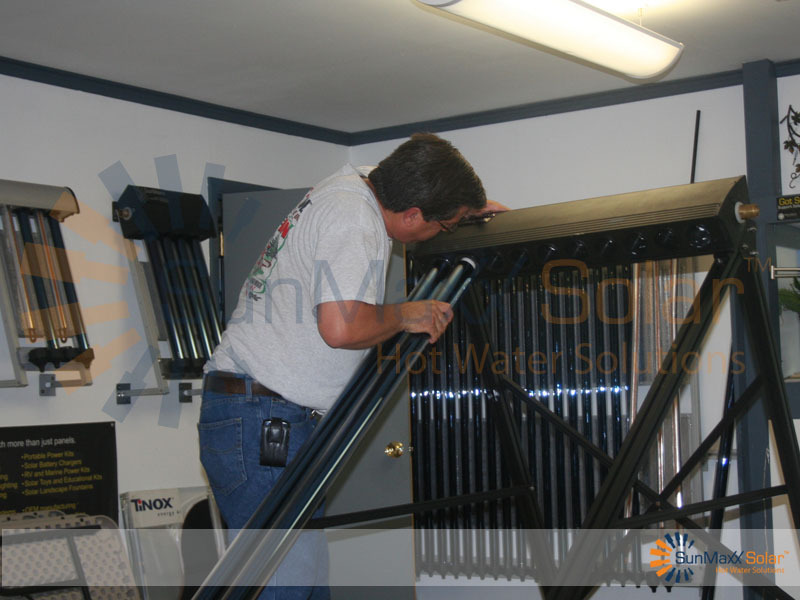 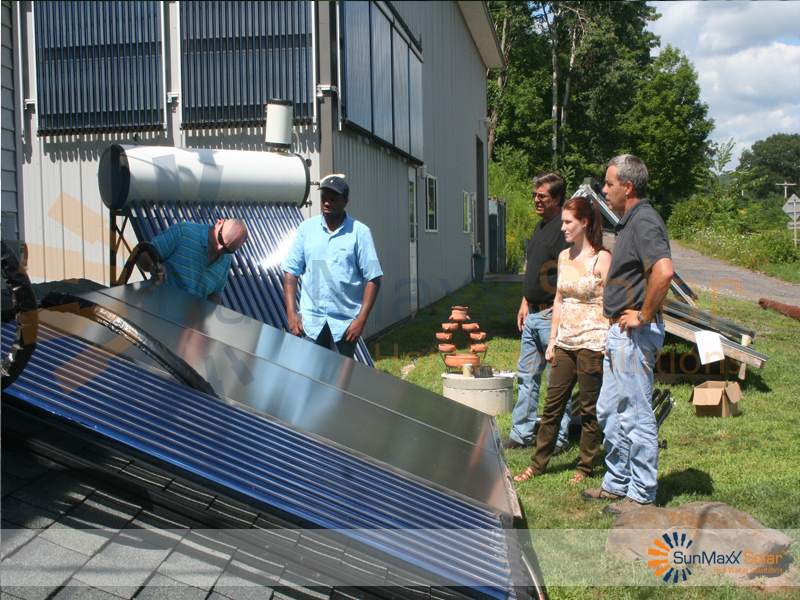 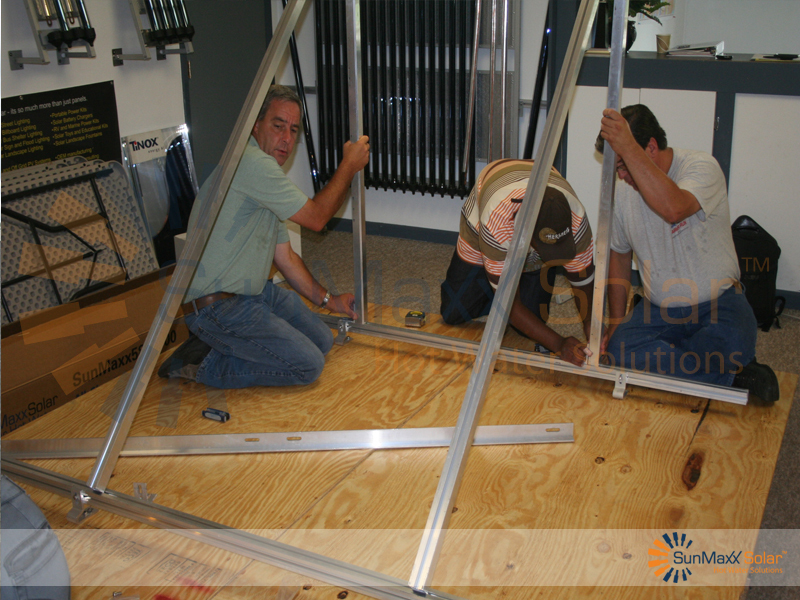 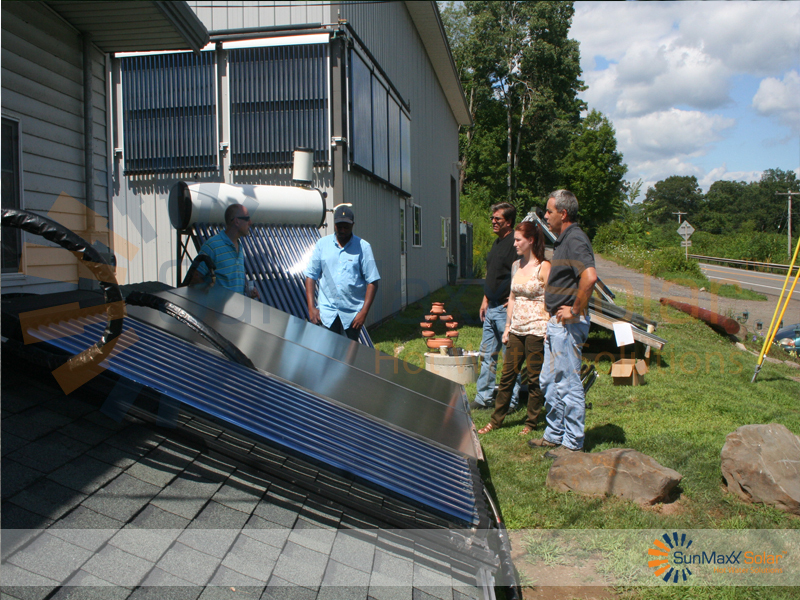 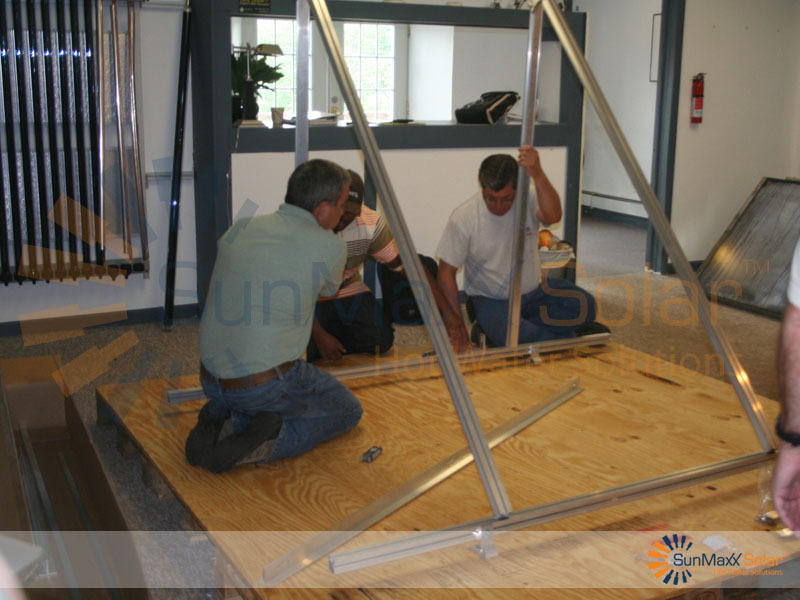 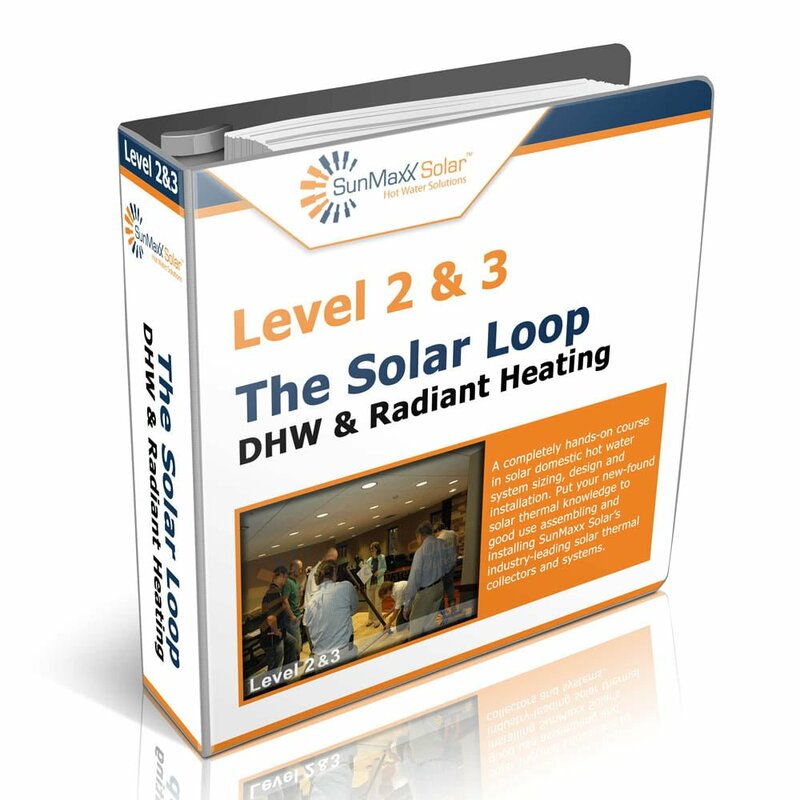 This is the solar thermal loop from start to finish and the perfect follow-up for SunMaxx dealers, installers and DIY-ers who have attended the Level 1 solar thermal training course. 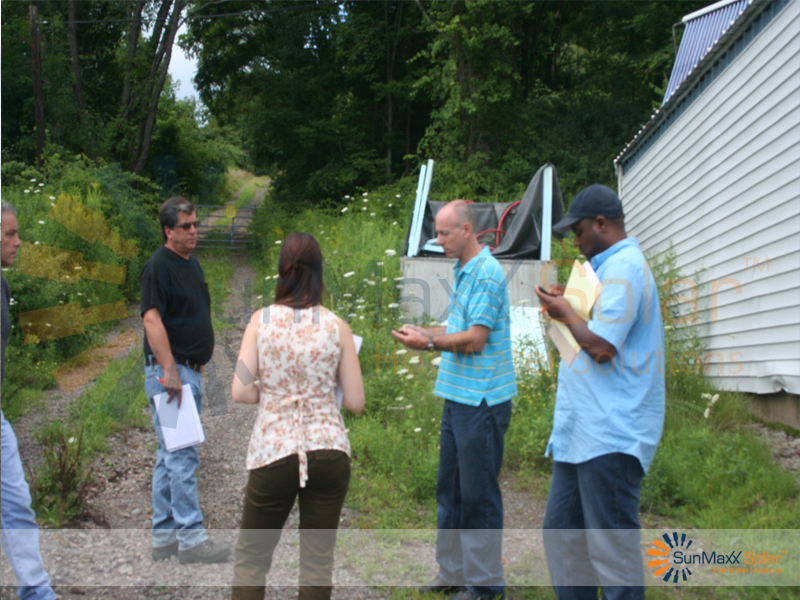 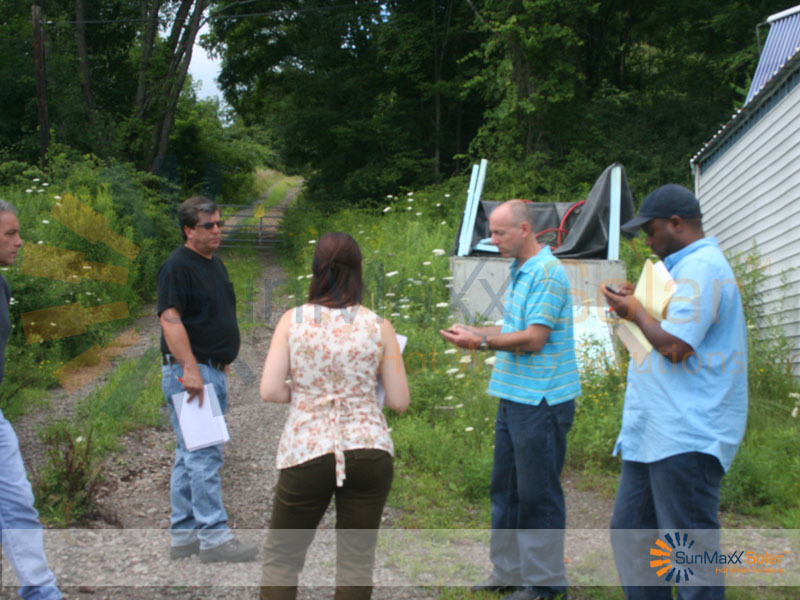 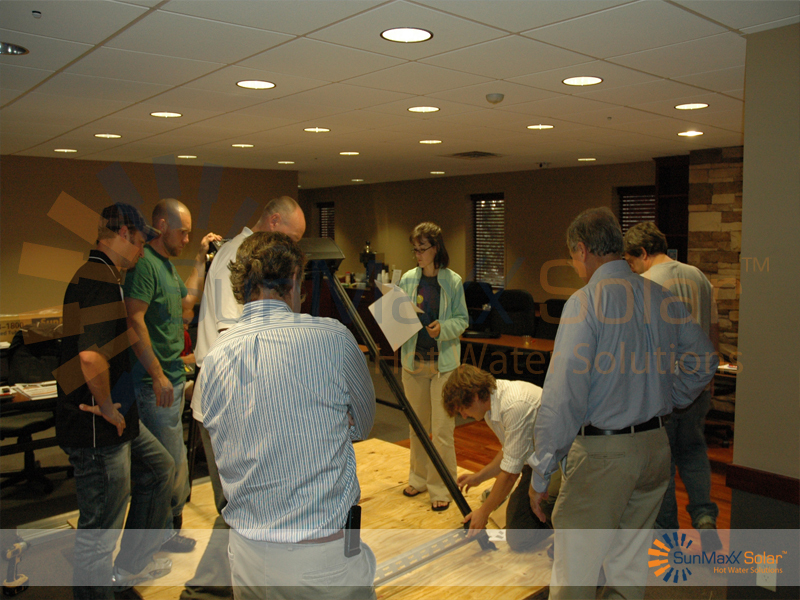 It begins with background knowledge required to conduct a site survey, and follows with site survey techniques. 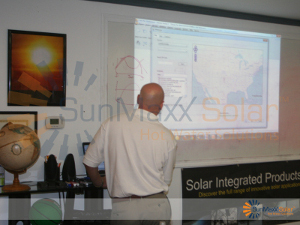 T*SOL software is introduced as a sizing tool. 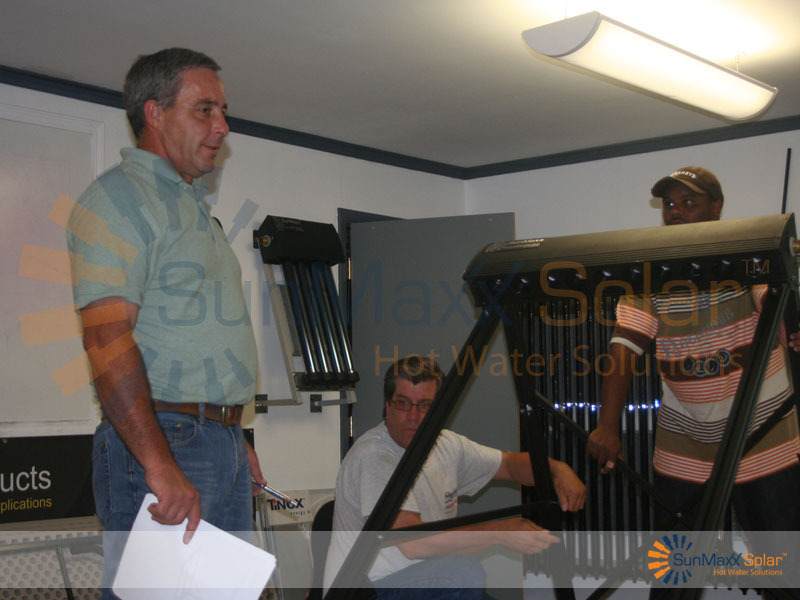 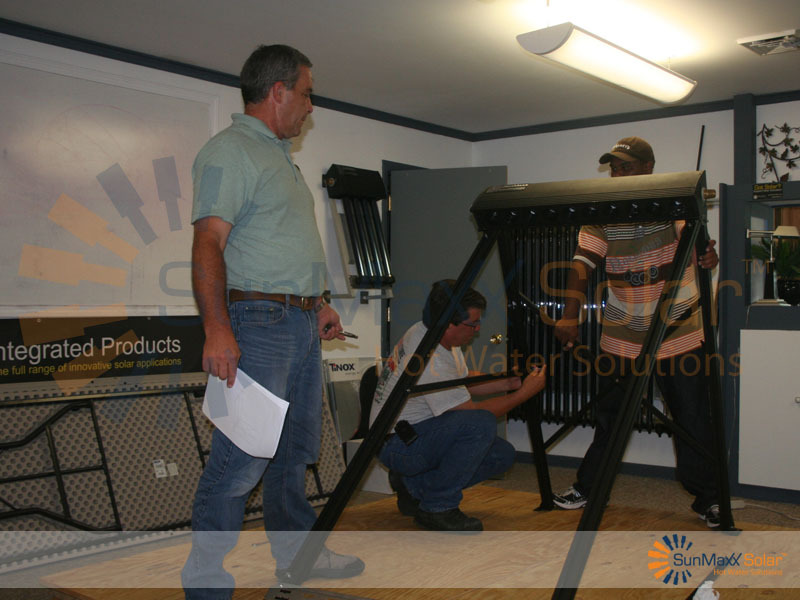 Participants will get hands-on experience in installing both our flat plate and evacuated tube collectors in various configurations, pump station and piping installation, setting up a controller, and testing and charging a solar thermal system.Make sure to purchase with other SunMaxx Solar Thermal Training workshops to receive a discounted price. 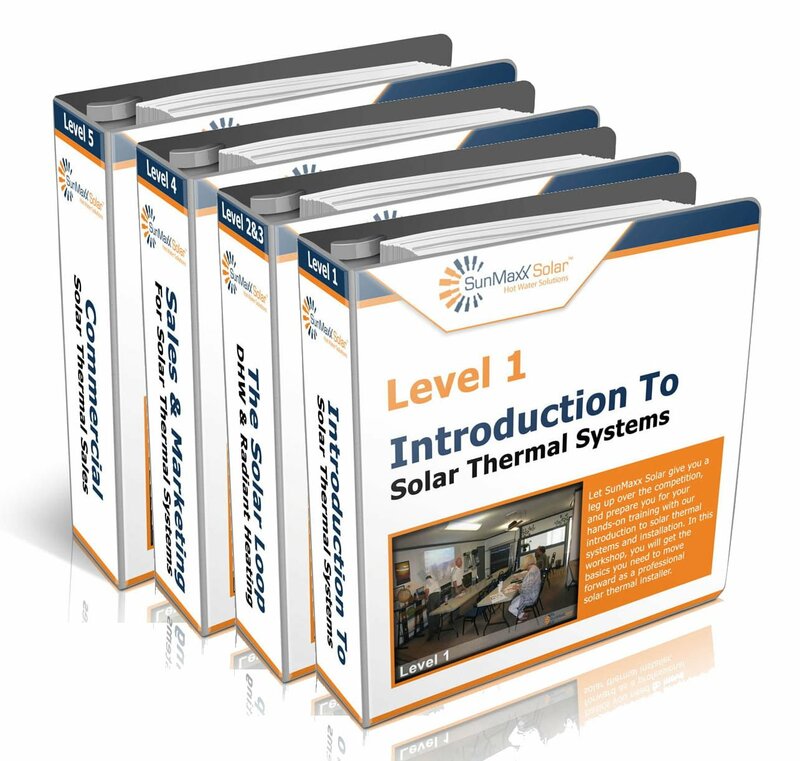 This course is an investment in your business you won't regret! 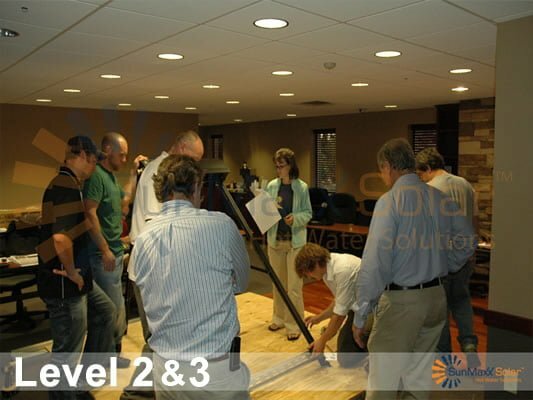 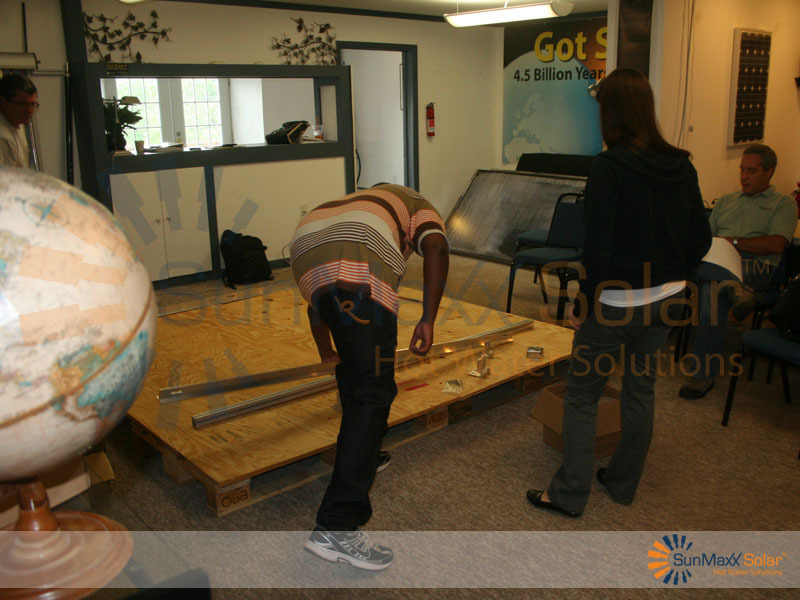 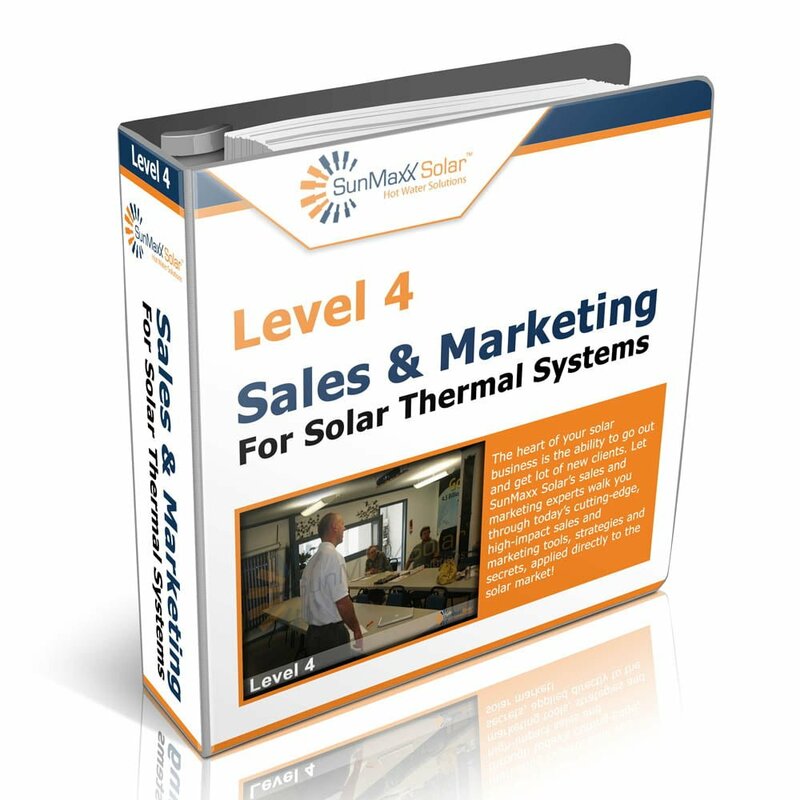 Drawing from inside knowledge of the Solar Thermal Industry, experience closing thousands of systems, and the best practices from our most successful dealers, we can tell you from experience: the methods covered in this course will launch your dealership and bring your business into full swing - not in two years, but in two months. 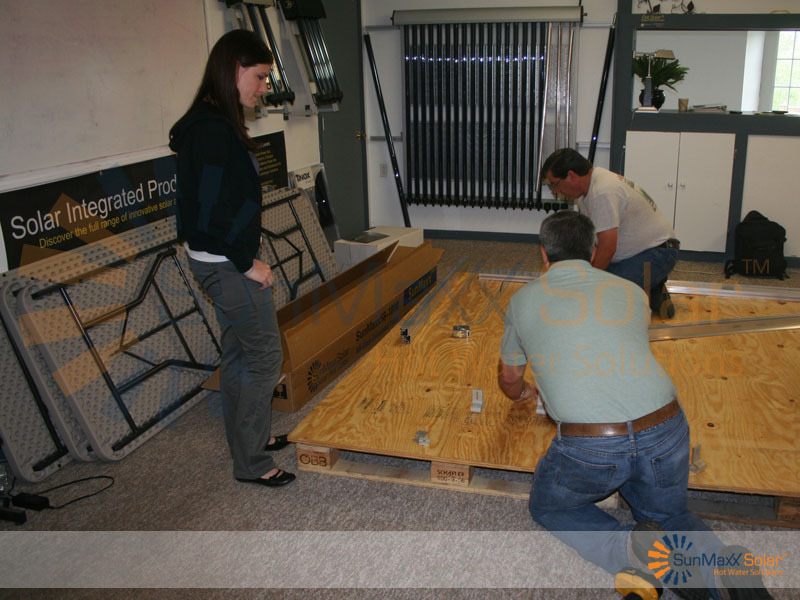 It draws from the best practices we've learned by helping our dealers land huge projects like the Aspen St. Regis Hotel, the Binghamton YMCA and the Wallkill Prison in Upstate NY. It will give you insider knowledge on commercial bidding and construction process, how to become the solar thermal contractor of choice in your area - letting you sell and close big projects, and how we can help. The commercial solar thermal sales and bidding process.